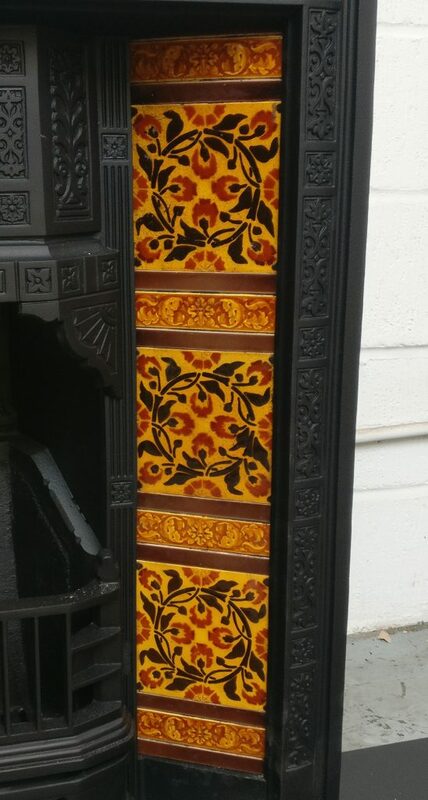 This is an original set of Victorian tiles. 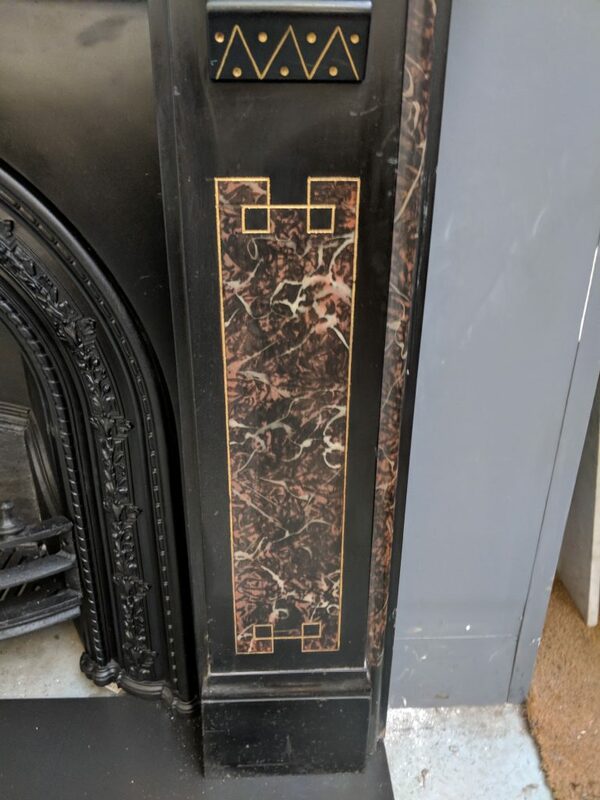 There are 10 tiles that are 6 x 6 inches which makes up the set. 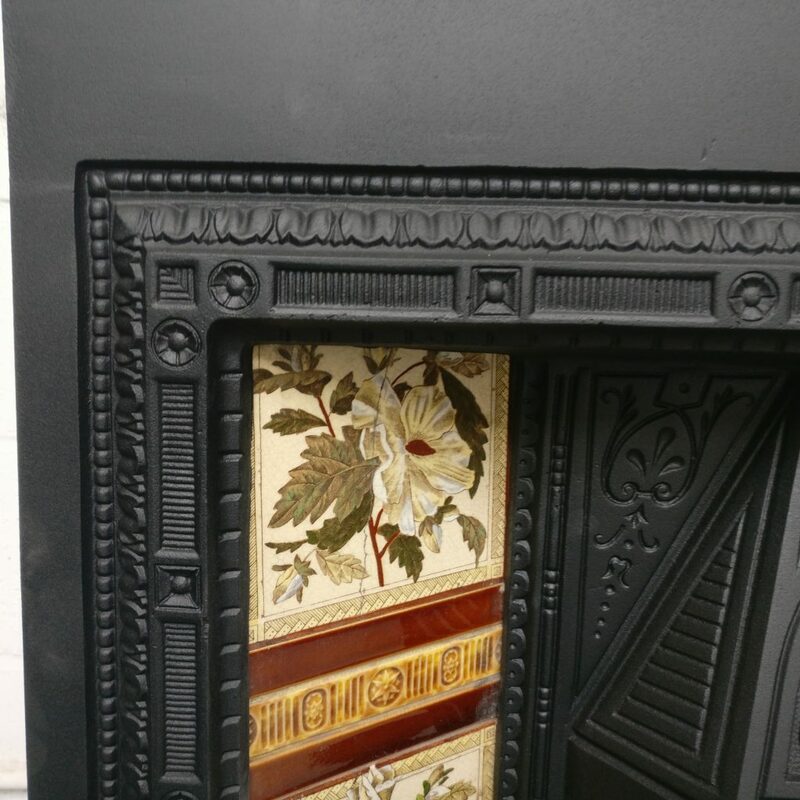 Most original tiles show wear and tear due to passage of time, please feel free to ask for complete pictures. 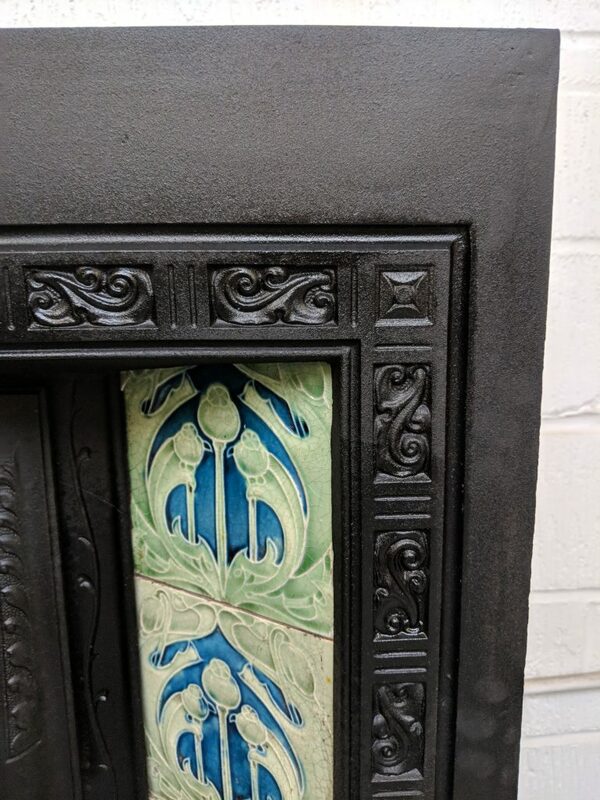 This is an original set of Art Nouveau tiles. 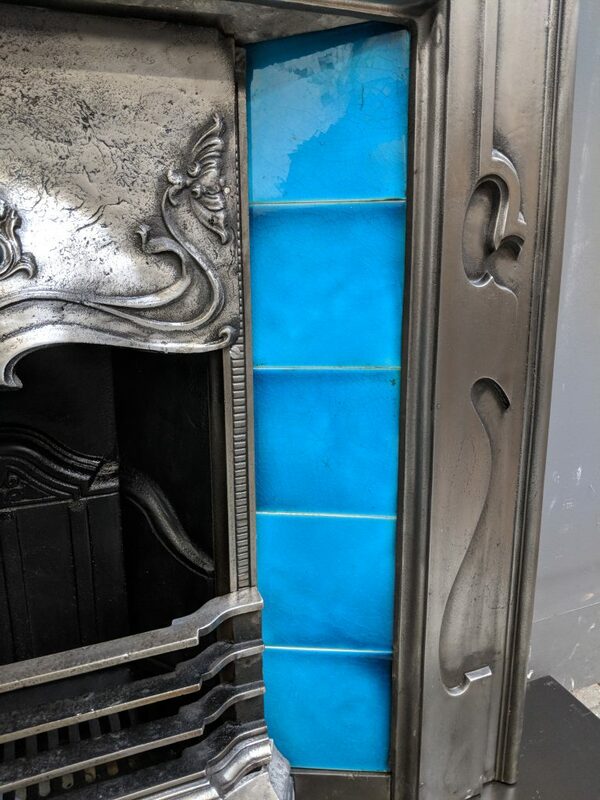 This is an original set of Edwardian Blue tiles. 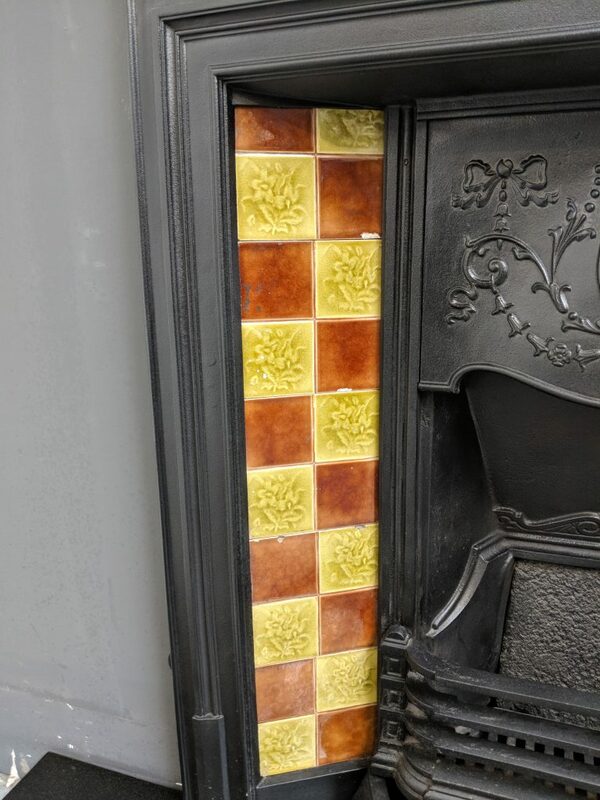 There are 6 tiles that are 6 x 6 inches and 8 tiles that are 3 x 6 inches which makes up the set. 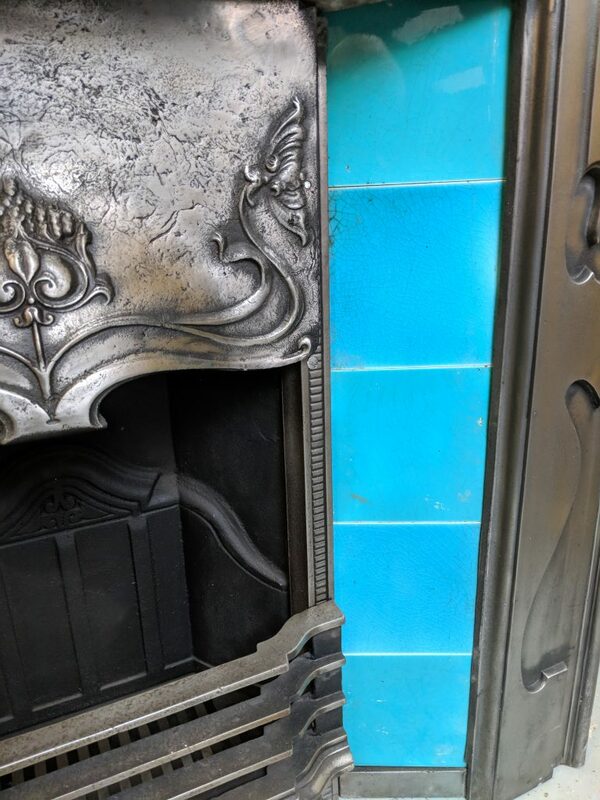 There are 8 tiles that are 6 x 6 inches and 4 tiles that are 3 x 6 inches which makes up the set. 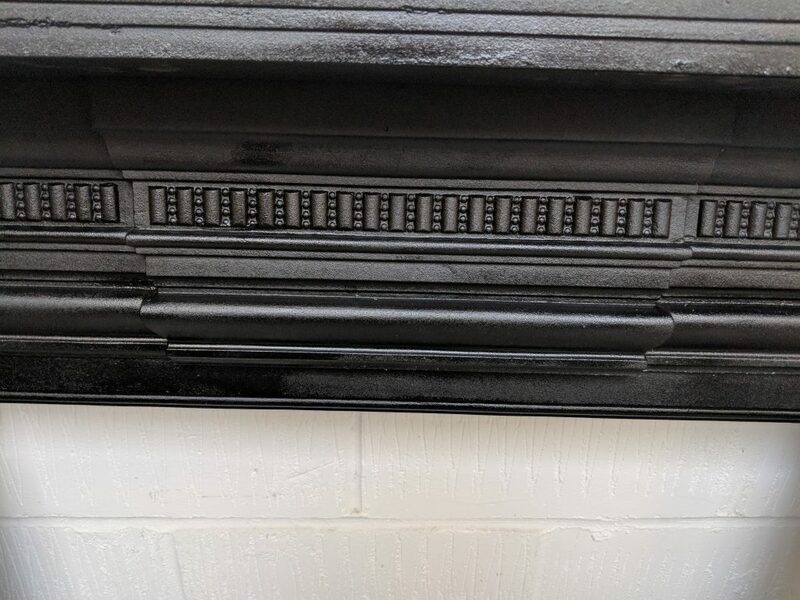 There are 6 tiles that are 6 x 6 inches and 8 tiles that are 3 x 6 which makes up the set. 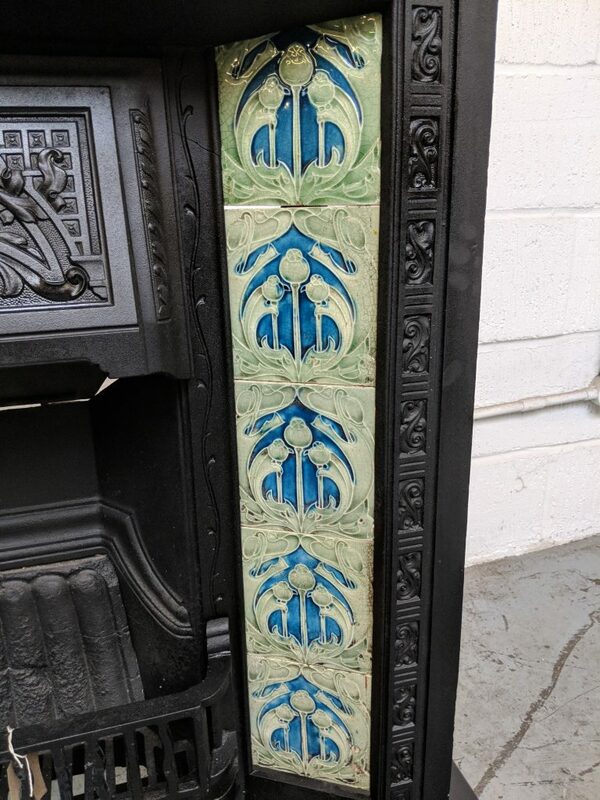 This is an original set of Victorian set of tiles. 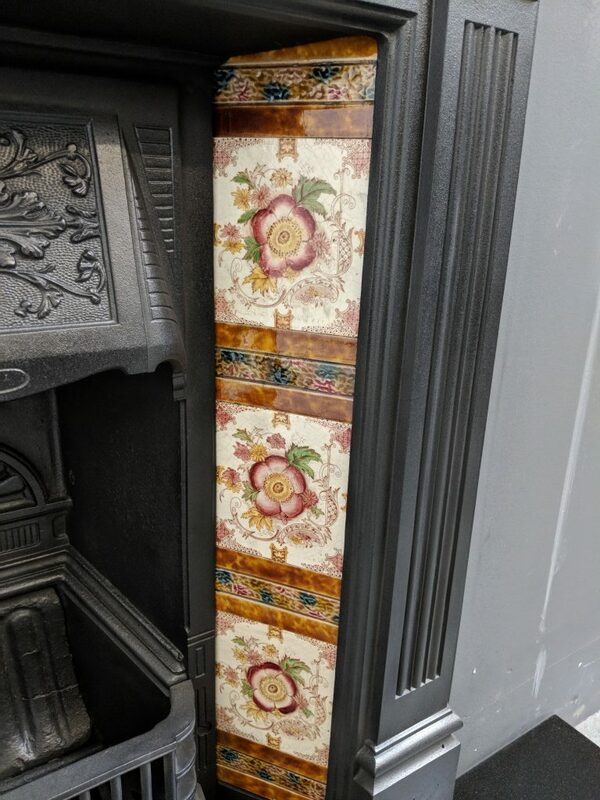 There are 12 tiles that are 6 x 6 inches which makes up the set. 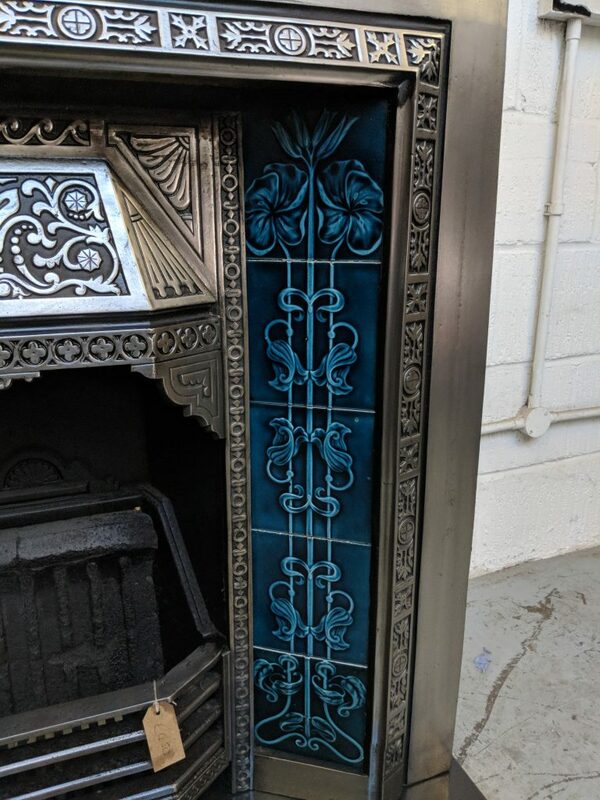 This is an original set of Art Nouveau Blue tiles. 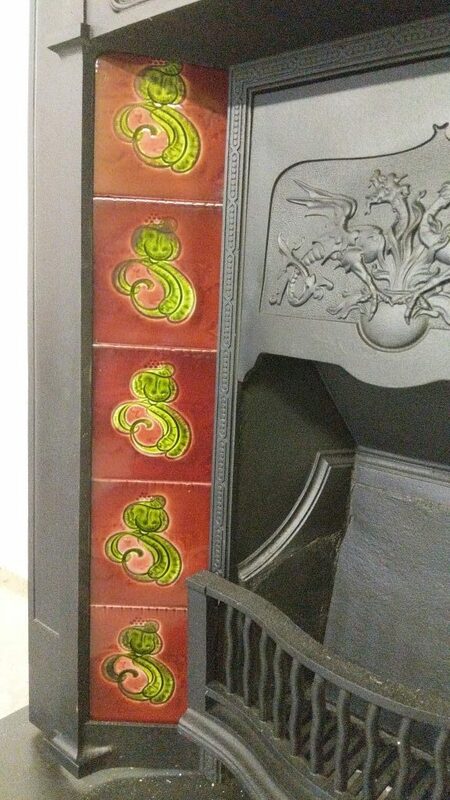 This is an original set of Victorian green and brown tiles. 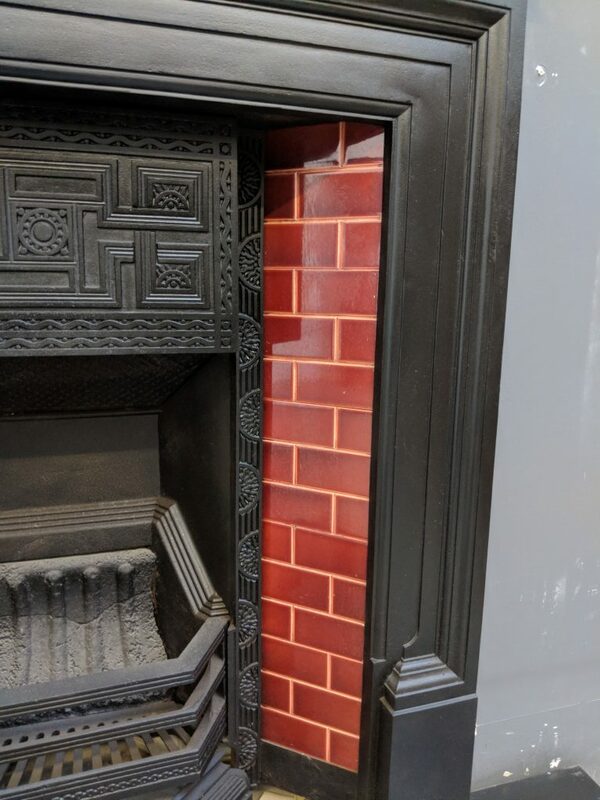 This is an original set of Edwardian red brick work tiles. 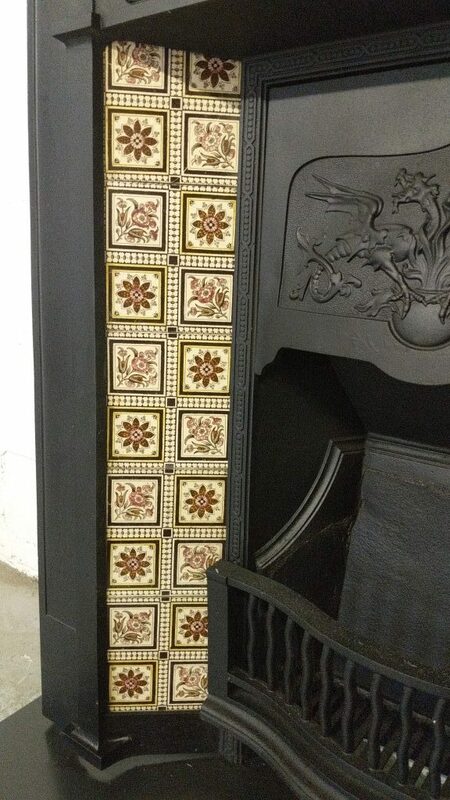 There are 6 tiles that are 6 x 6 inches and 8 6 x 3 inches spacer tiles which makes up the set. 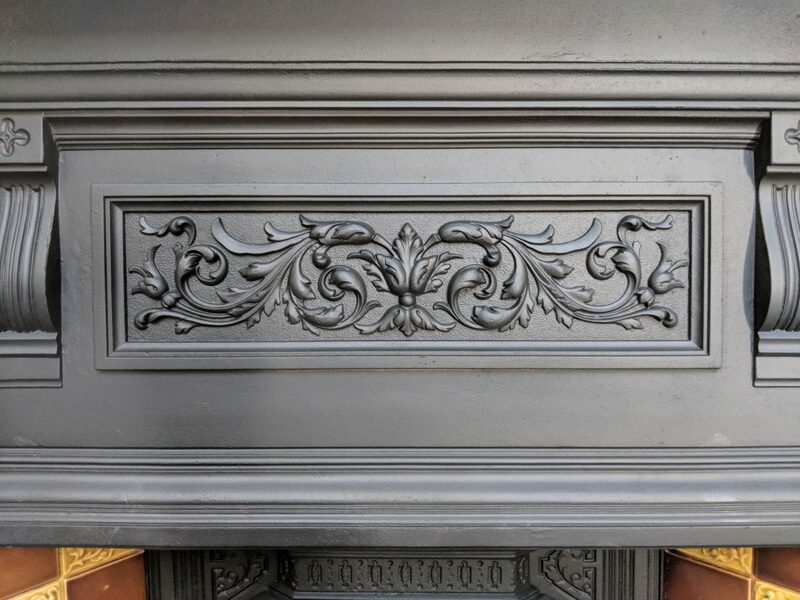 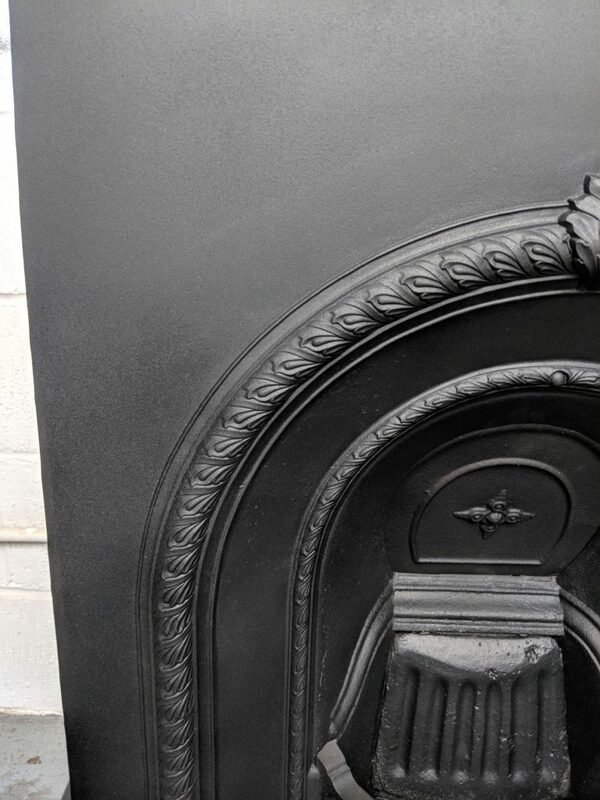 The fireplace Is shown on a Slate hearth, all our hearths can be made to measure. 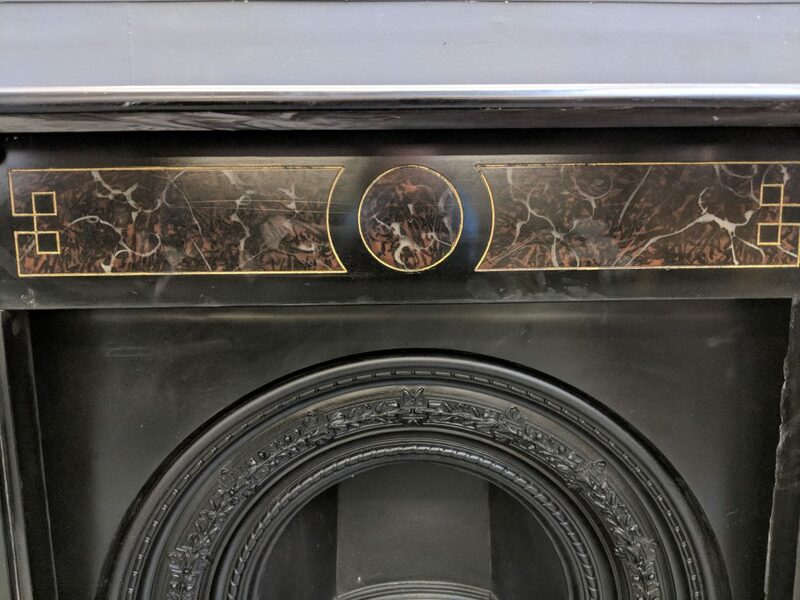 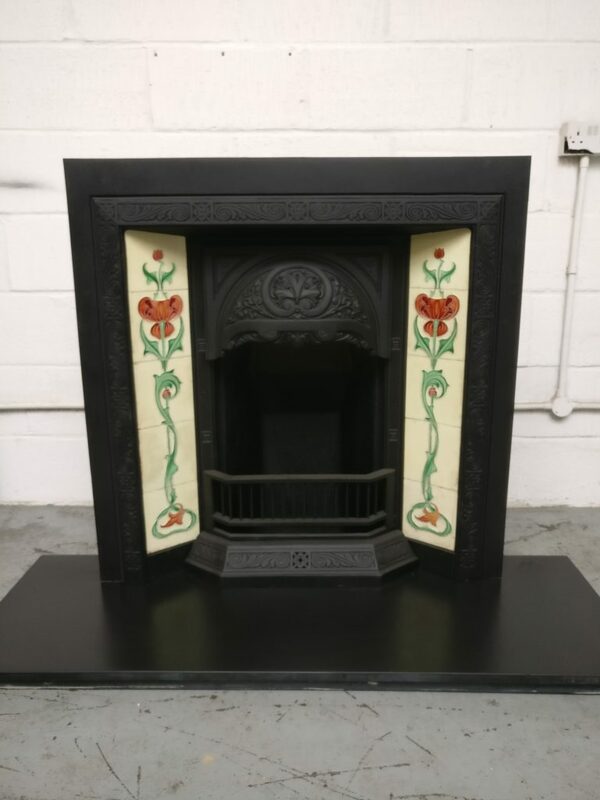 The fireplace Is shown on a granite hearth, all our hearths can be made to measure. 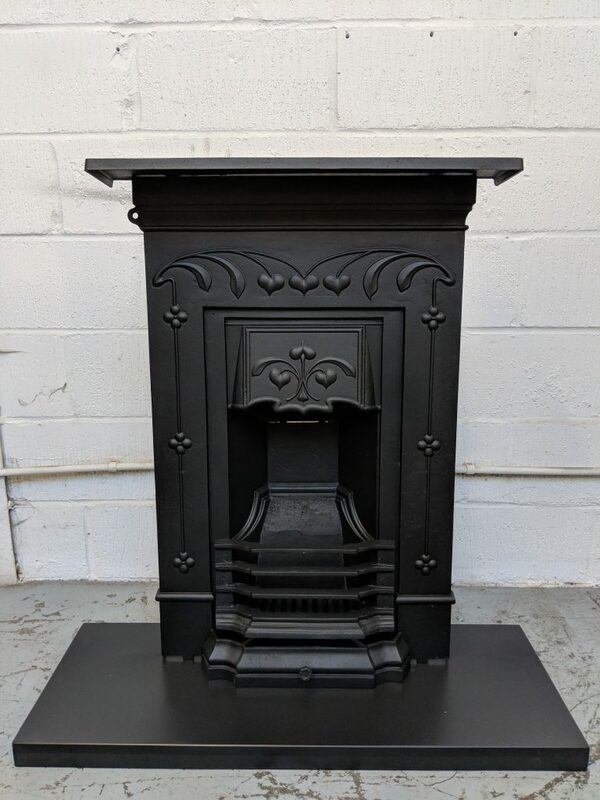 This is a Victorian 36 x 36 inch cast iron tiled insert restored in a black finish. 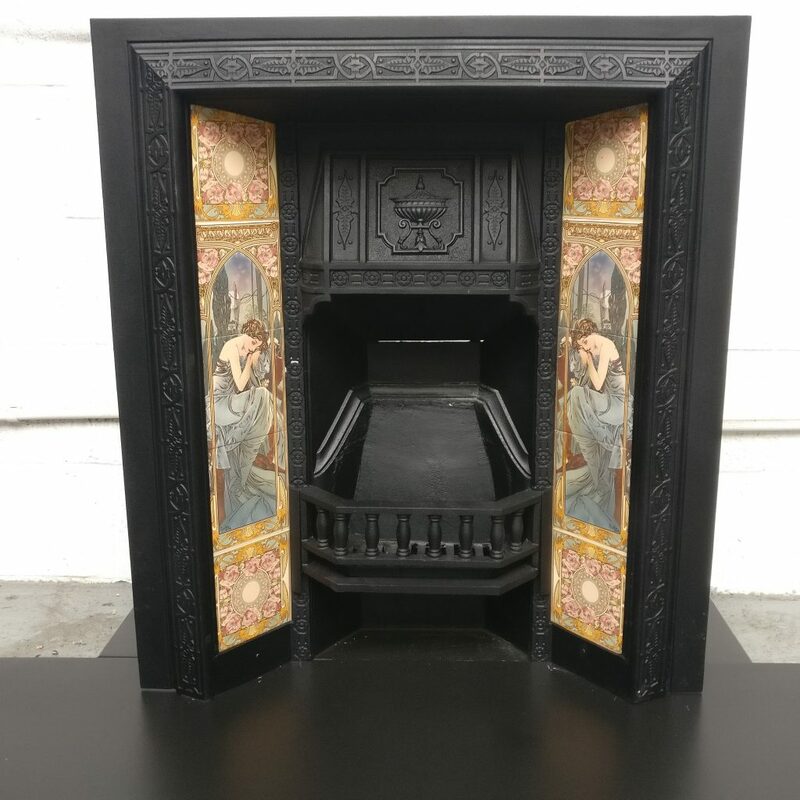 wood, cast iron or slate surround. 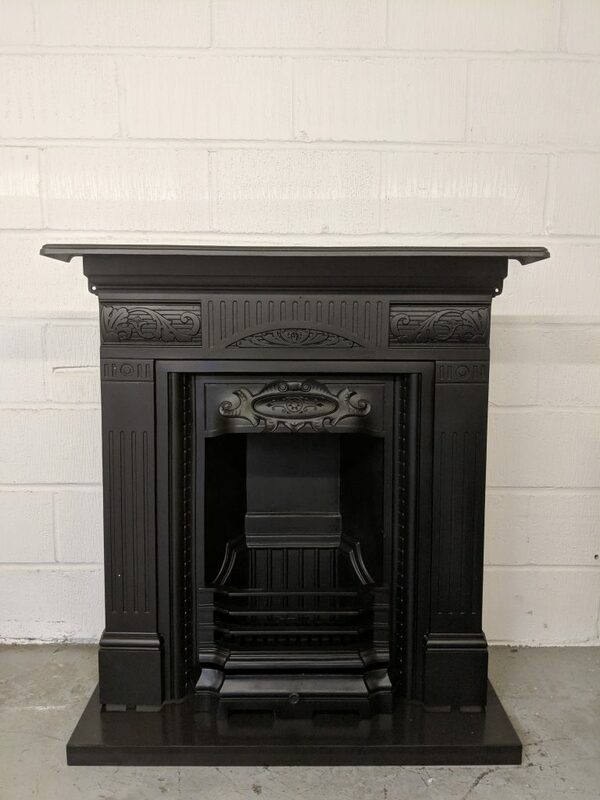 You can contact us for more information and prices. 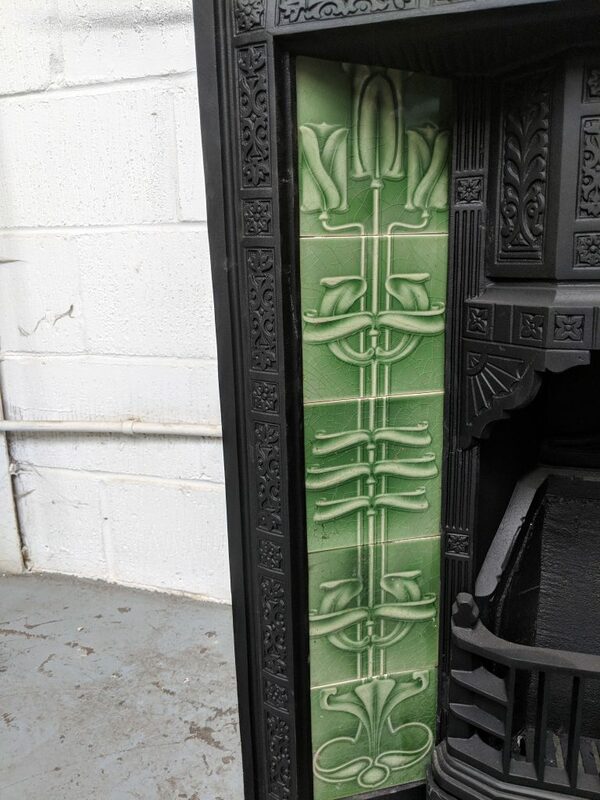 The fireplace is shown with a set of original tiles ref tile0014, priced at £150. 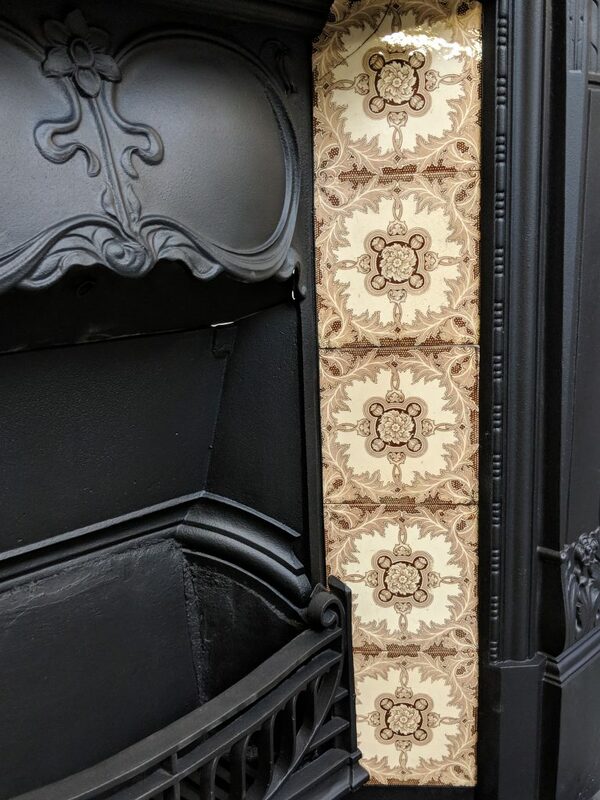 all tiles are sold separately. 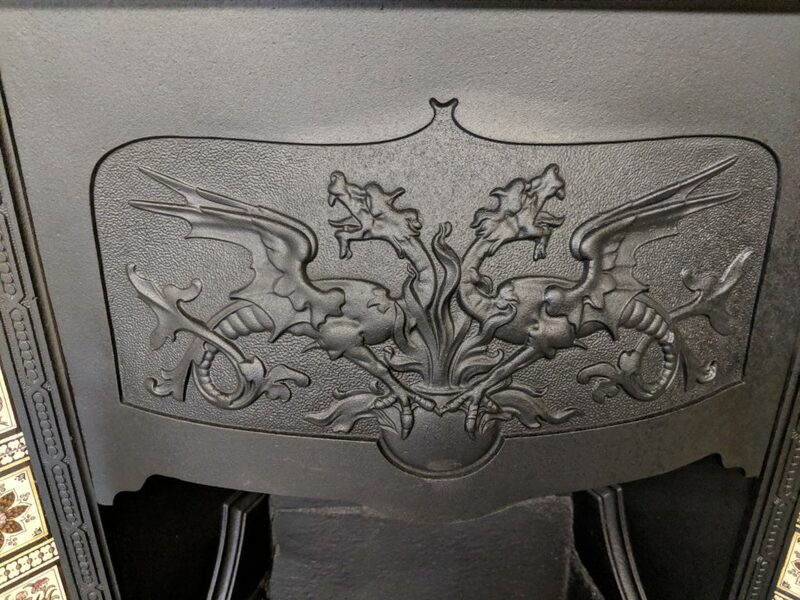 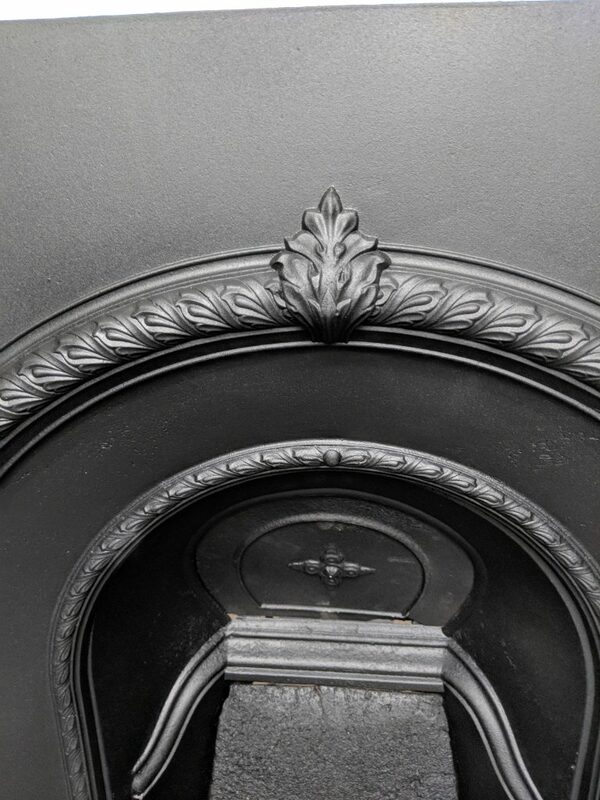 Close up of hood detail. 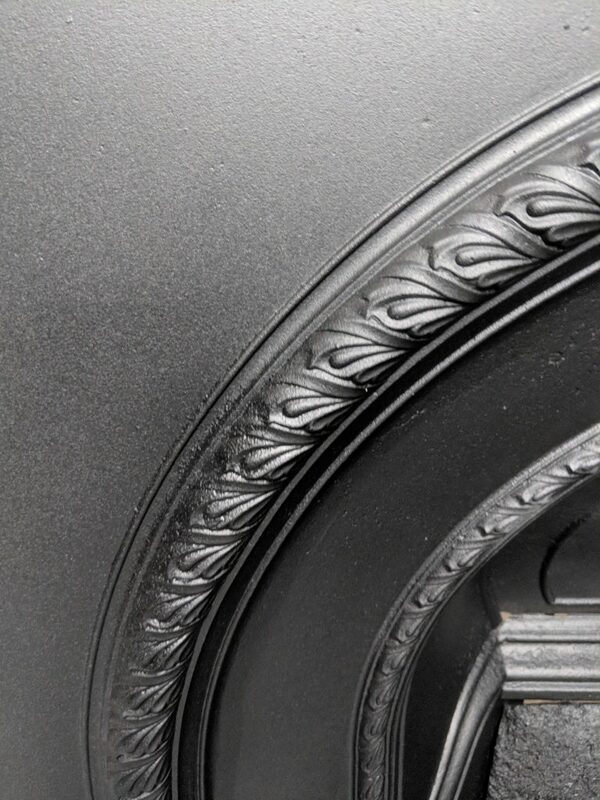 Close up of decorative band detail. 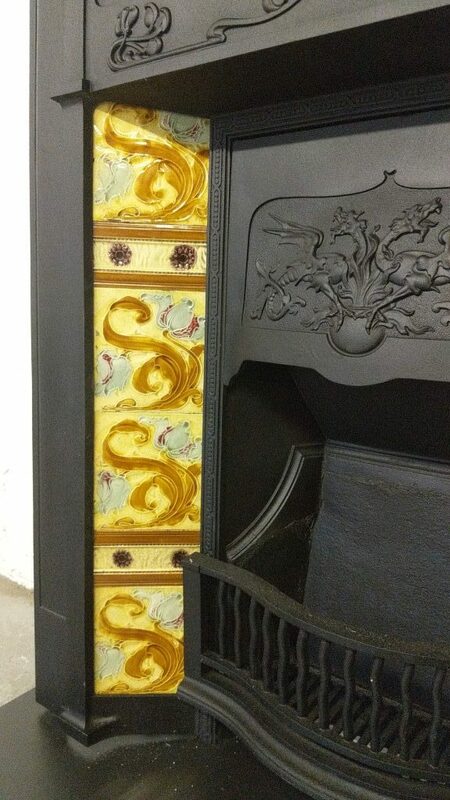 Close up of tile panel. 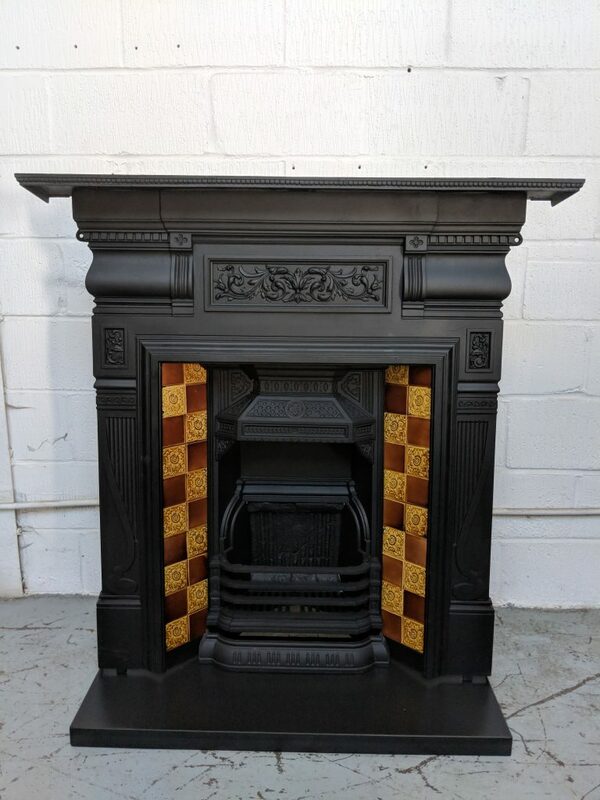 This is a Victorian 36 x 38 inch cast iron tiled insert restored in a black finish. 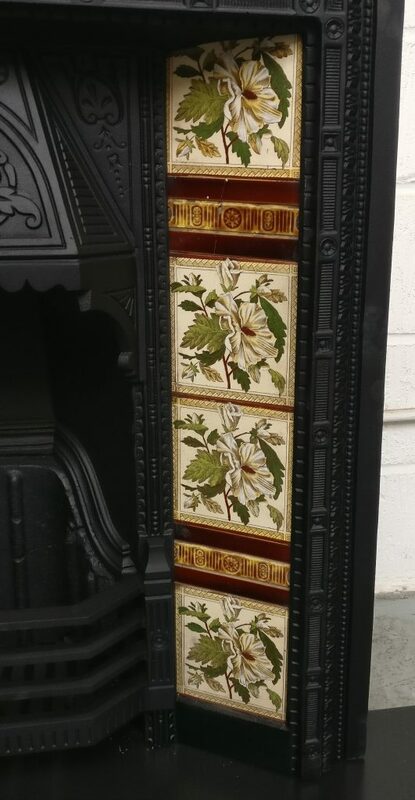 The fireplace is shown with a set of original tiles ref tile0013, priced at £150. 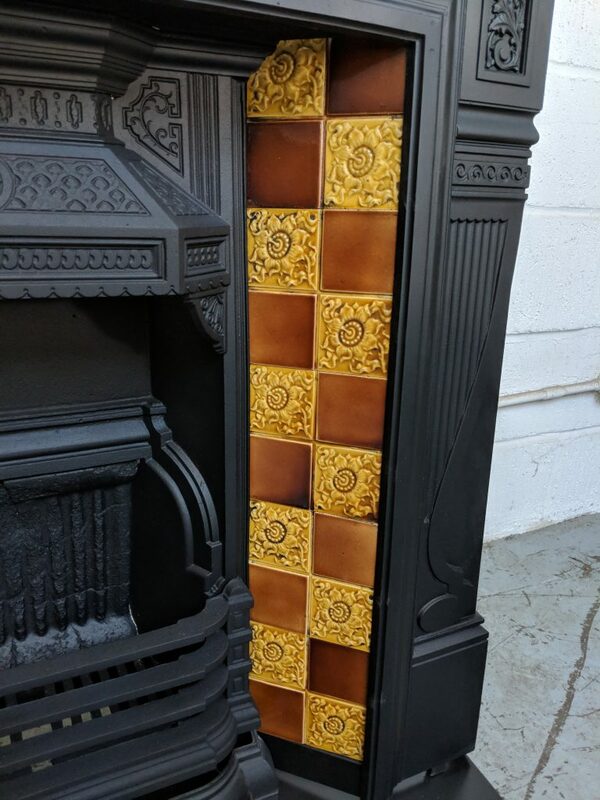 all tiles are sold separately. 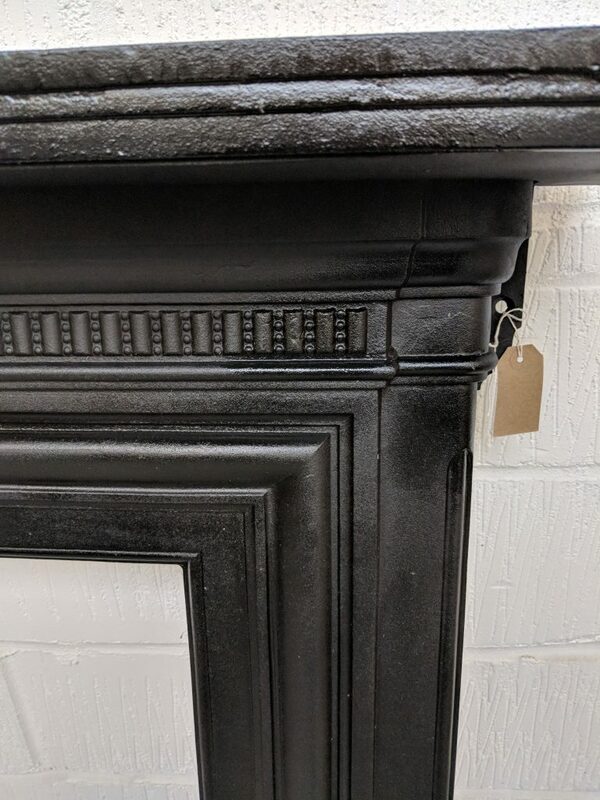 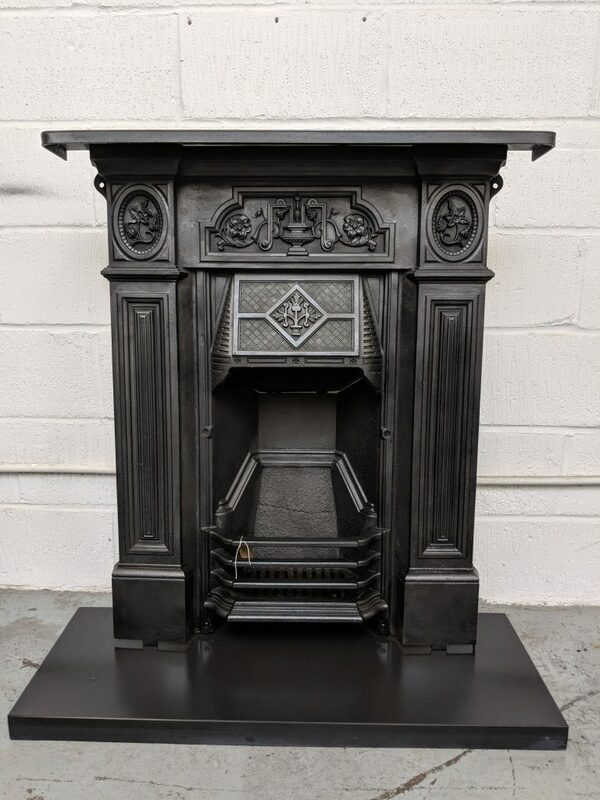 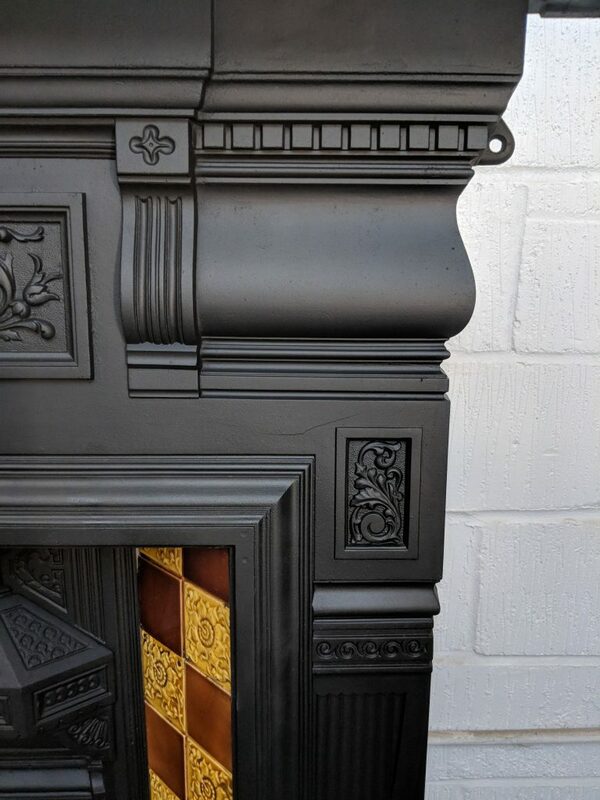 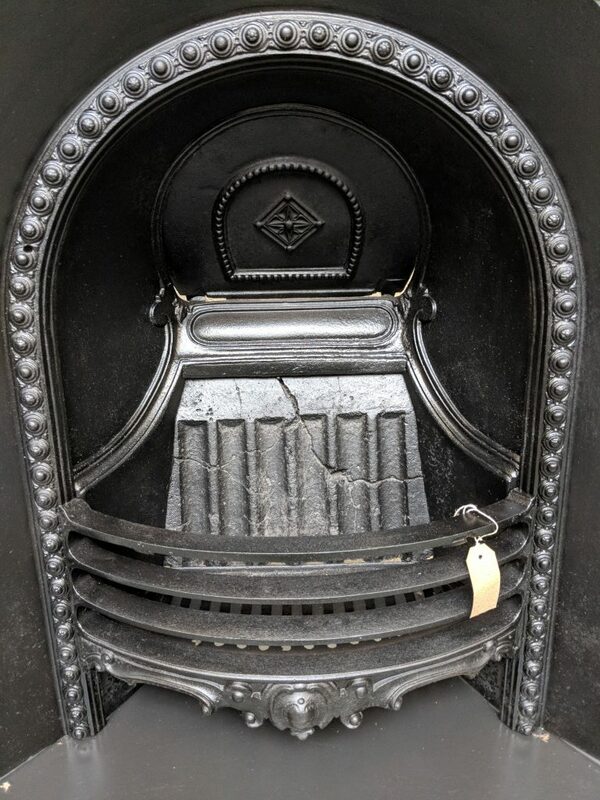 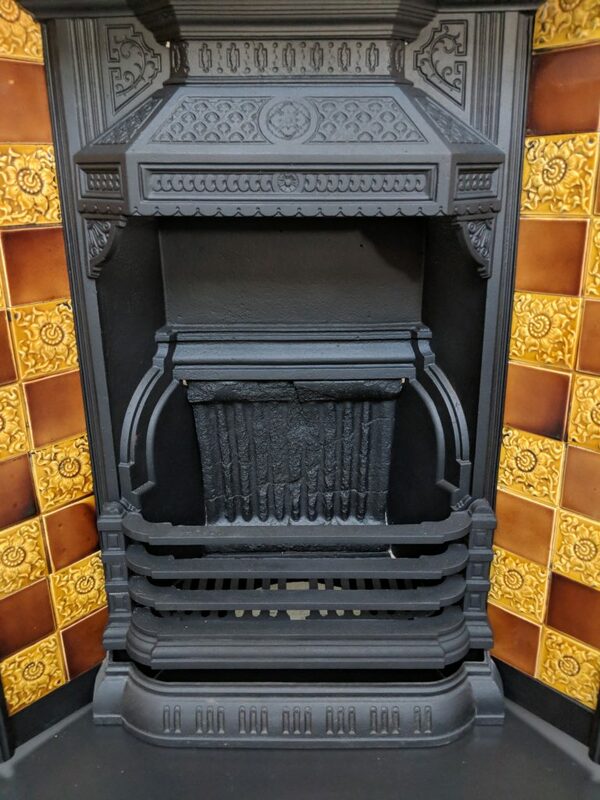 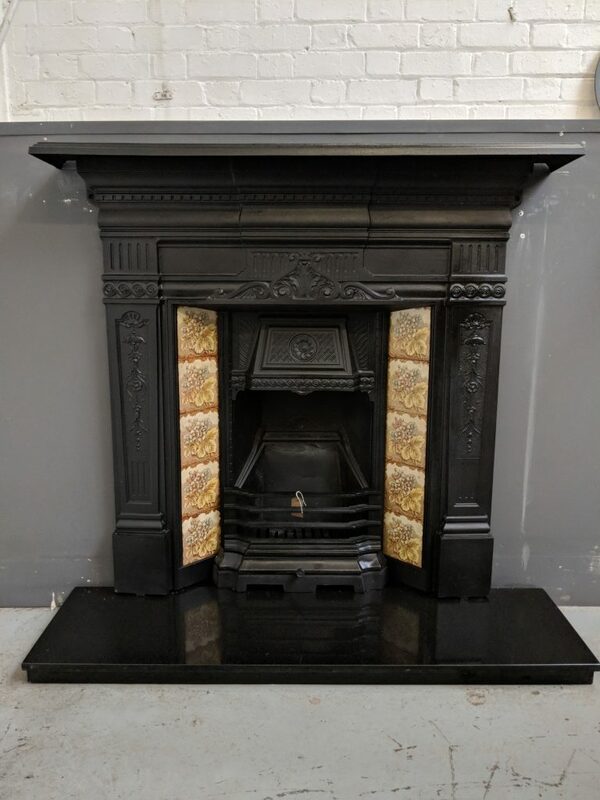 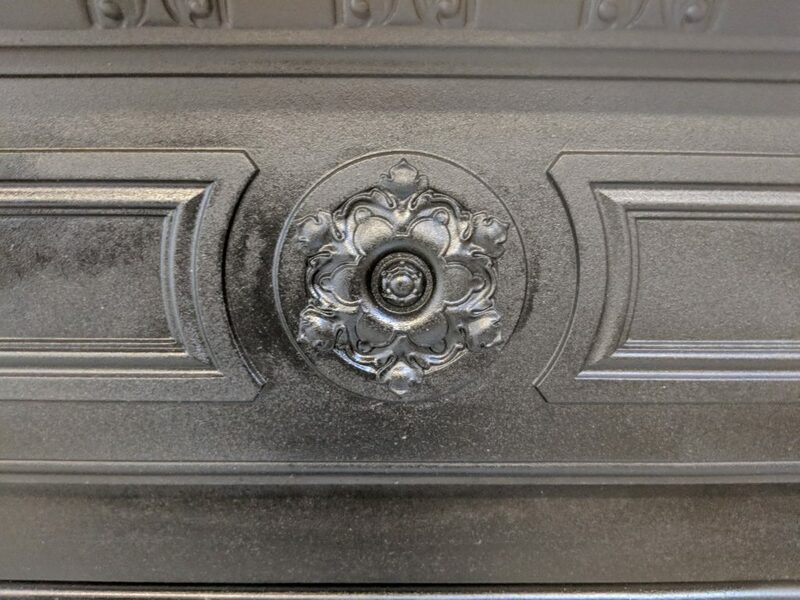 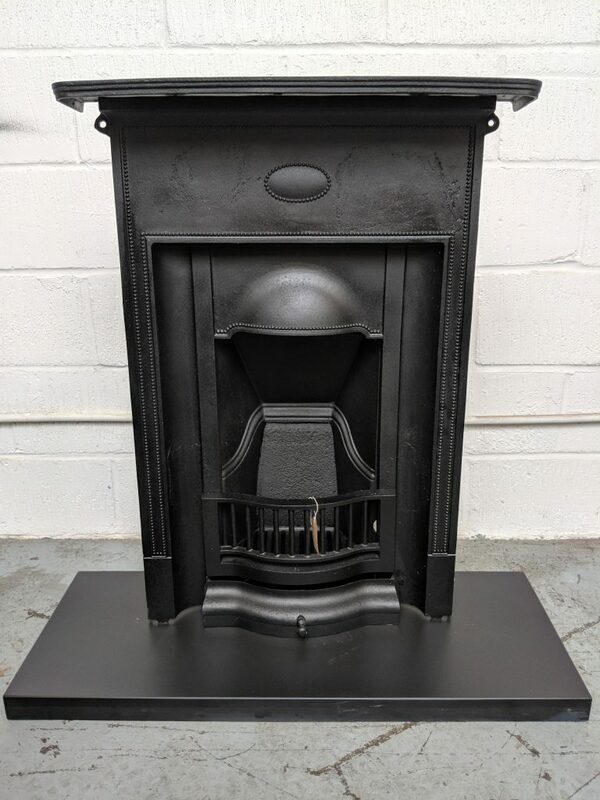 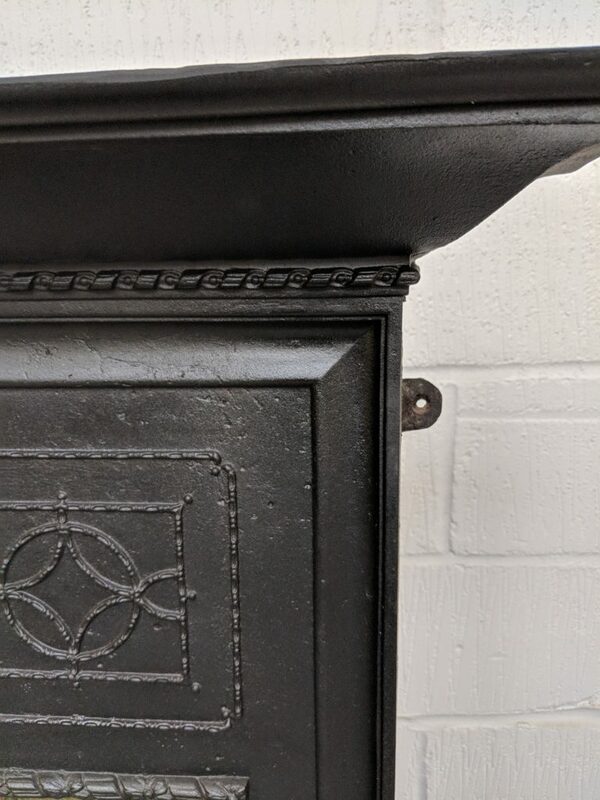 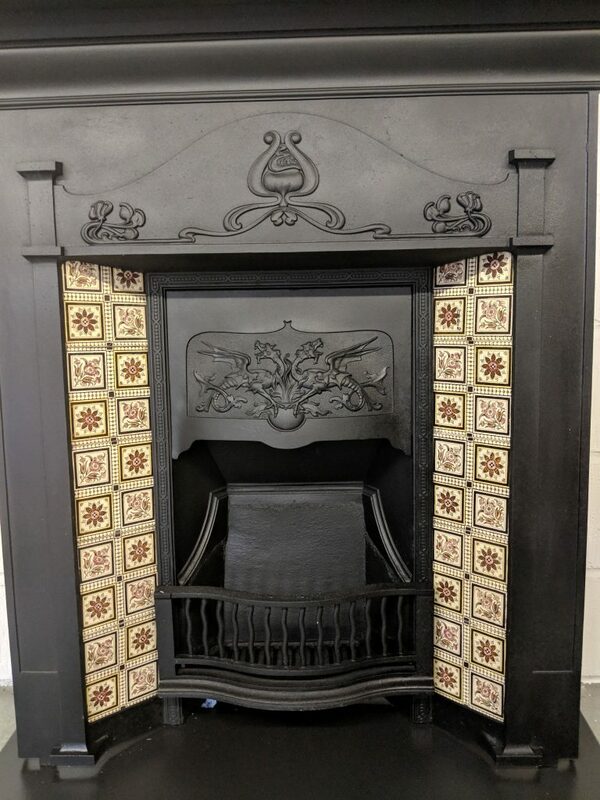 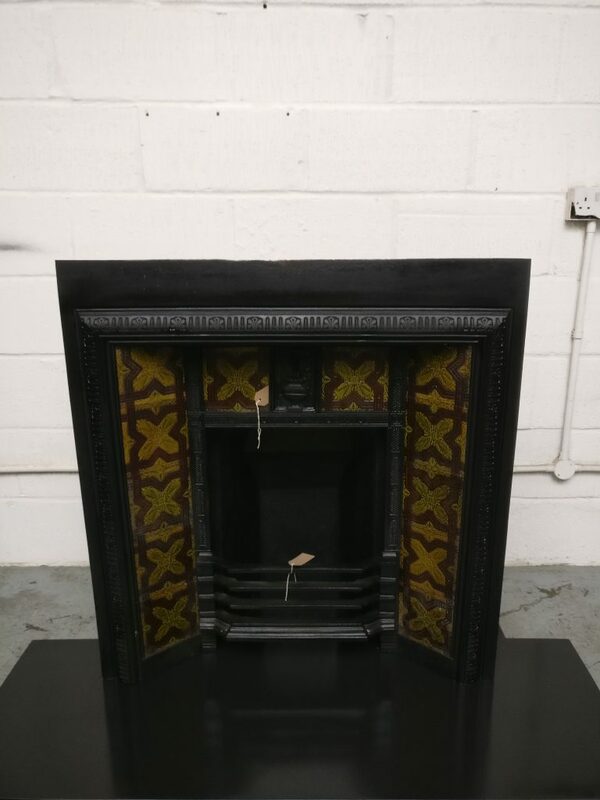 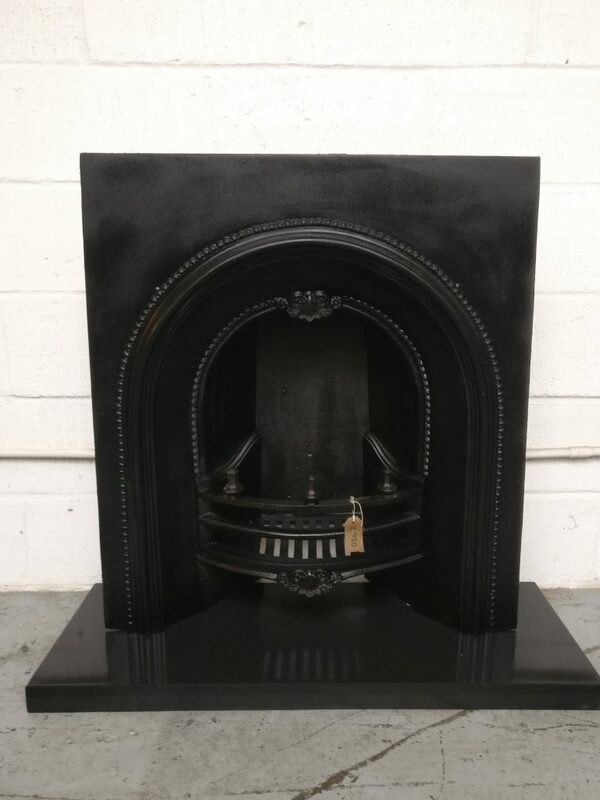 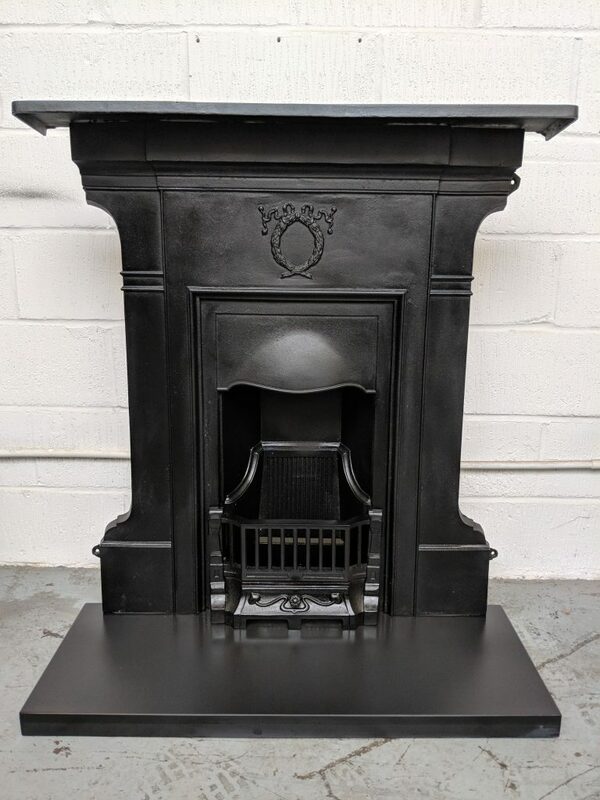 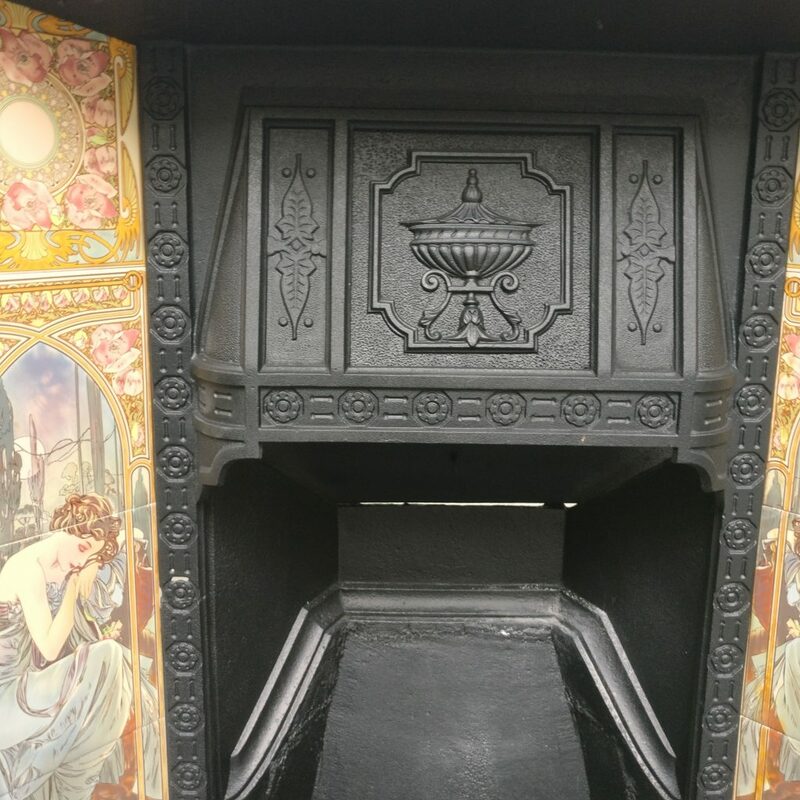 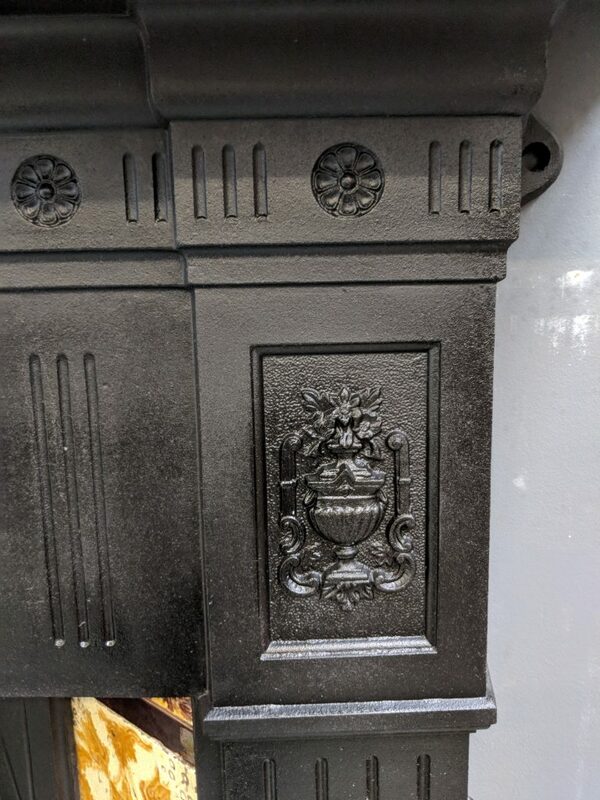 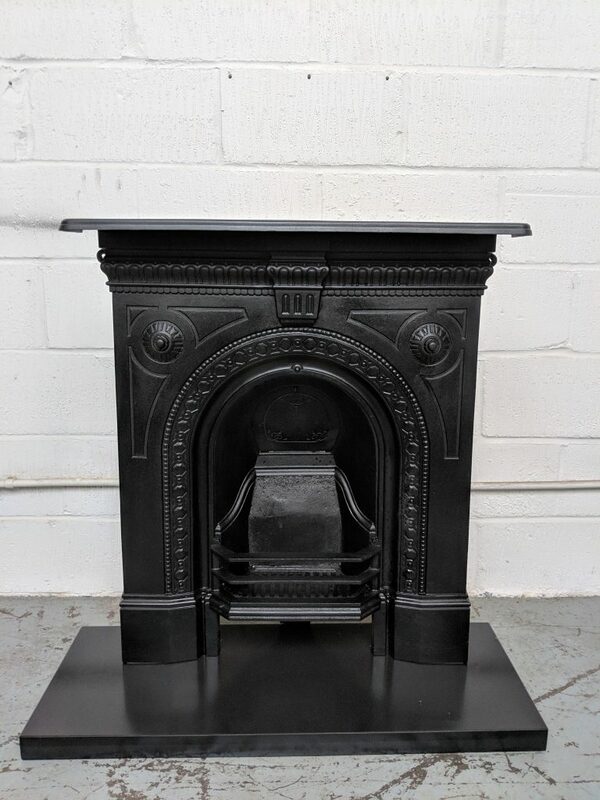 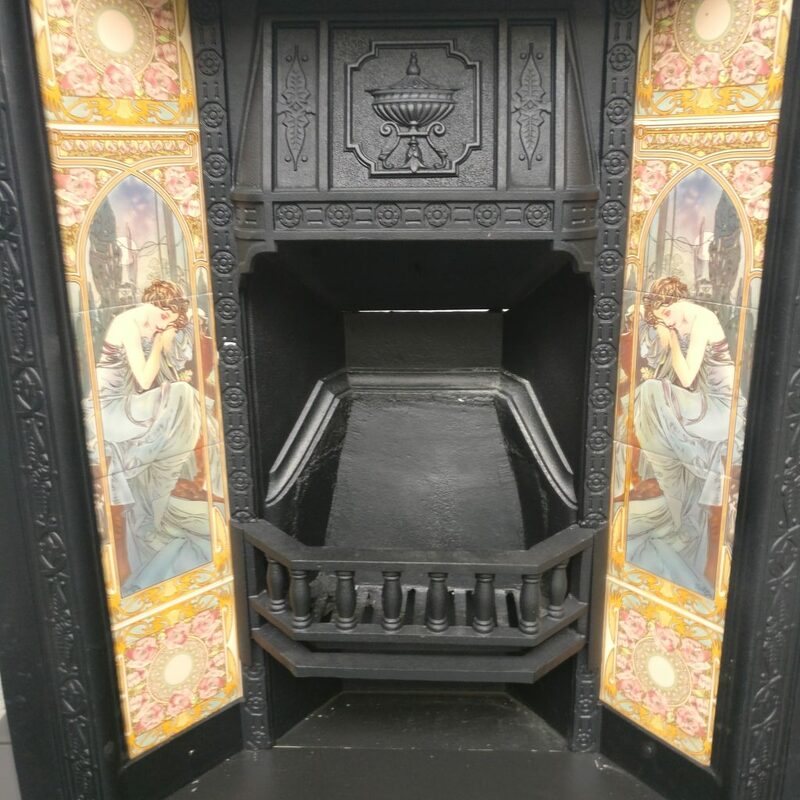 This is a Victorian 32 x 36 inch cast iron tiled insert restored in a black finish. 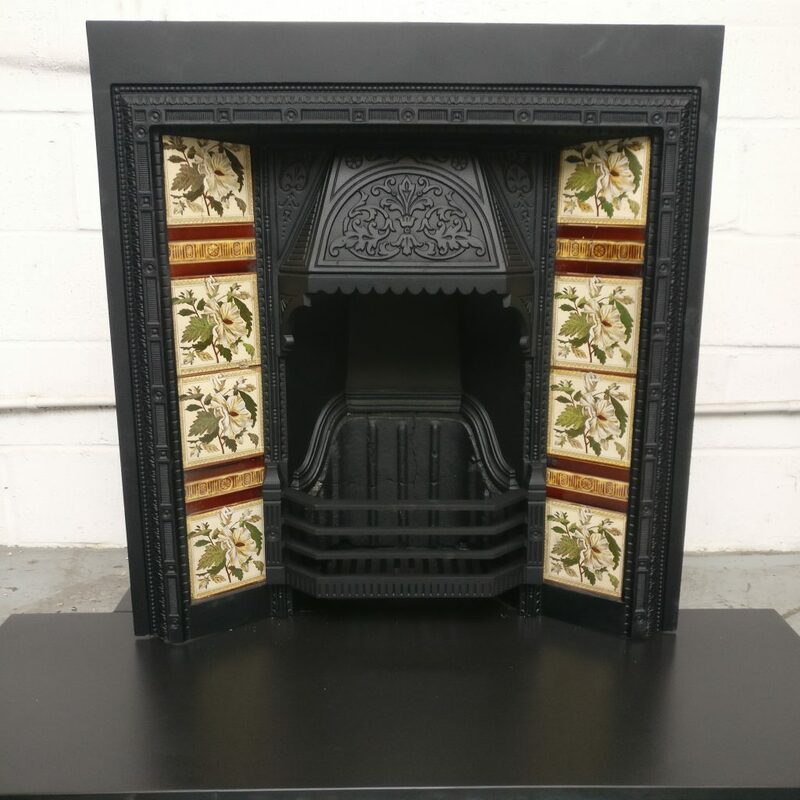 The fireplace is shown with a set of used reproduction tiles priced at £80, all tiles are sold separately. 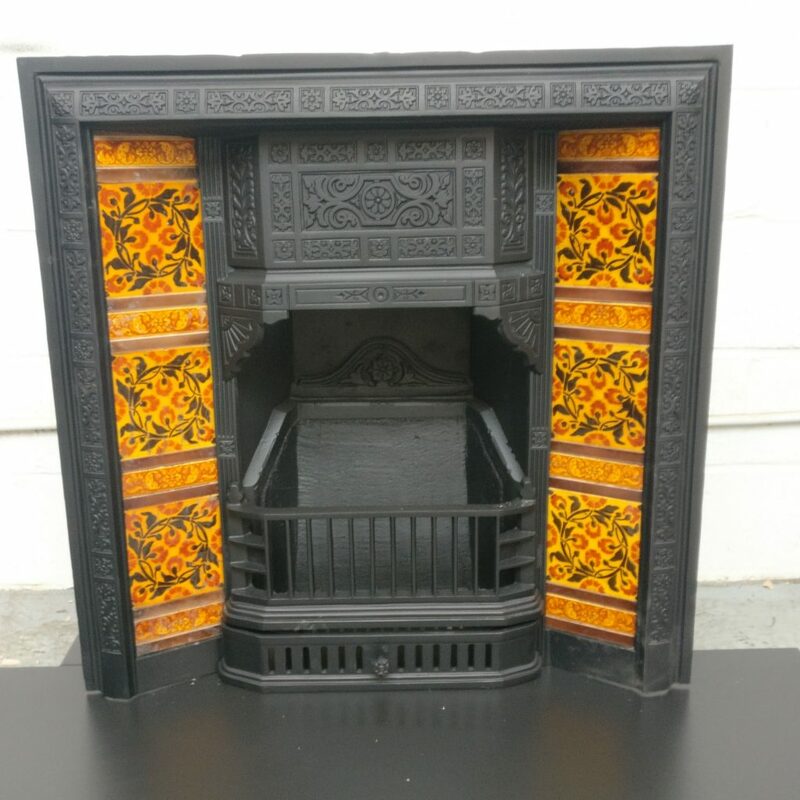 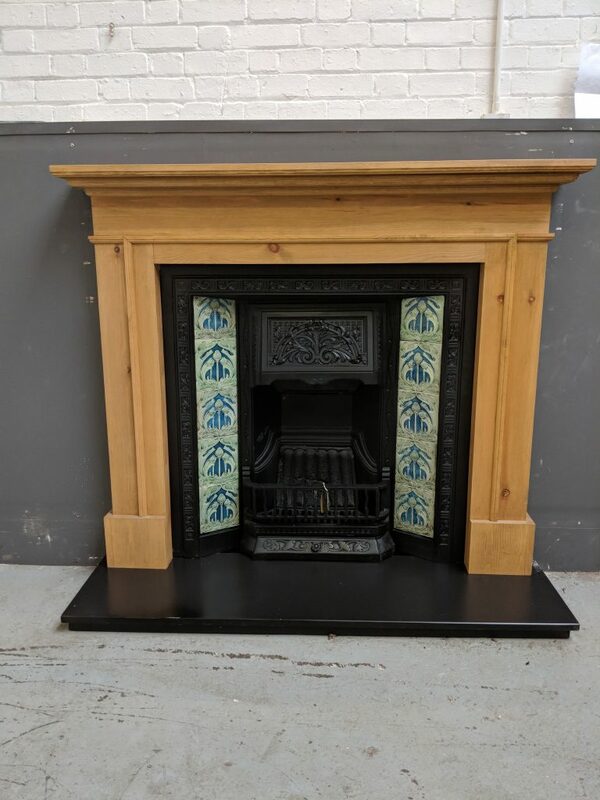 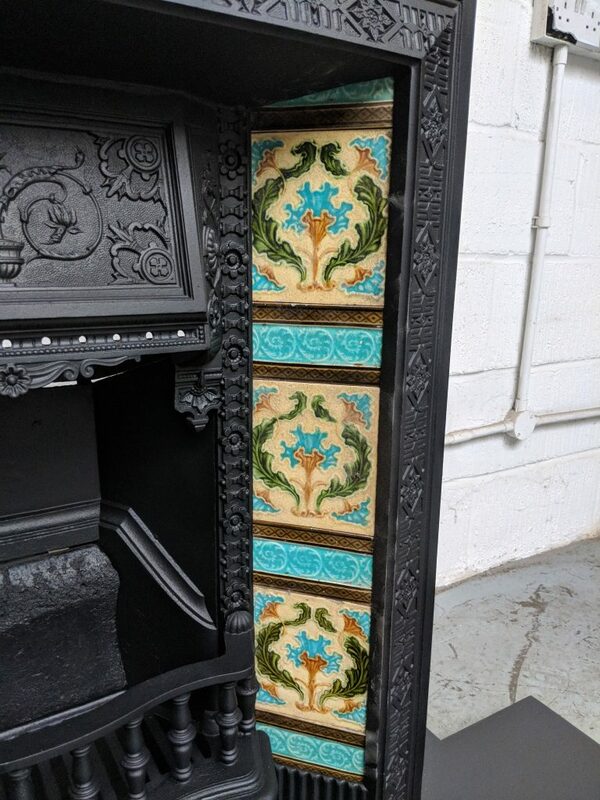 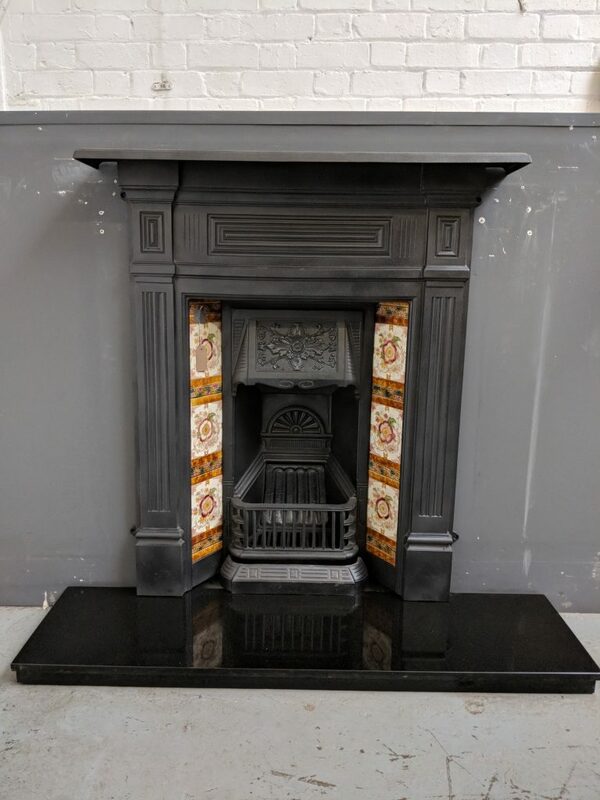 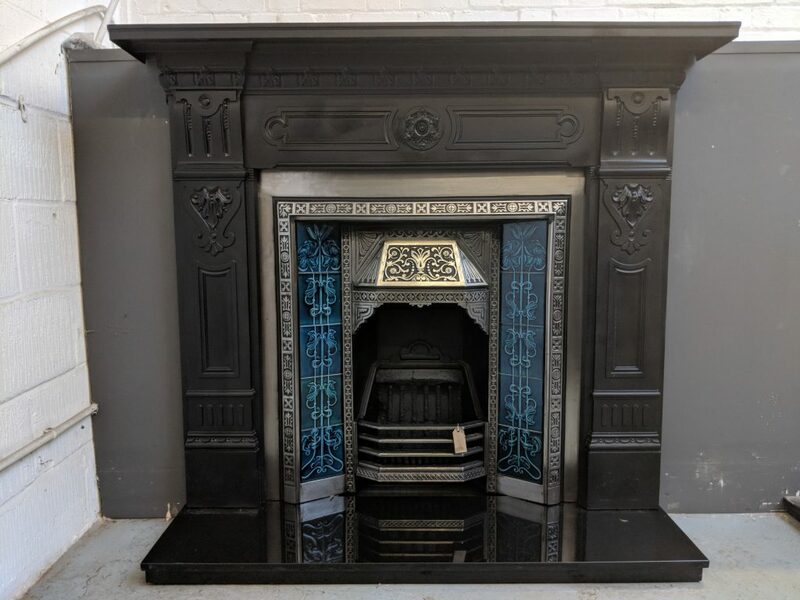 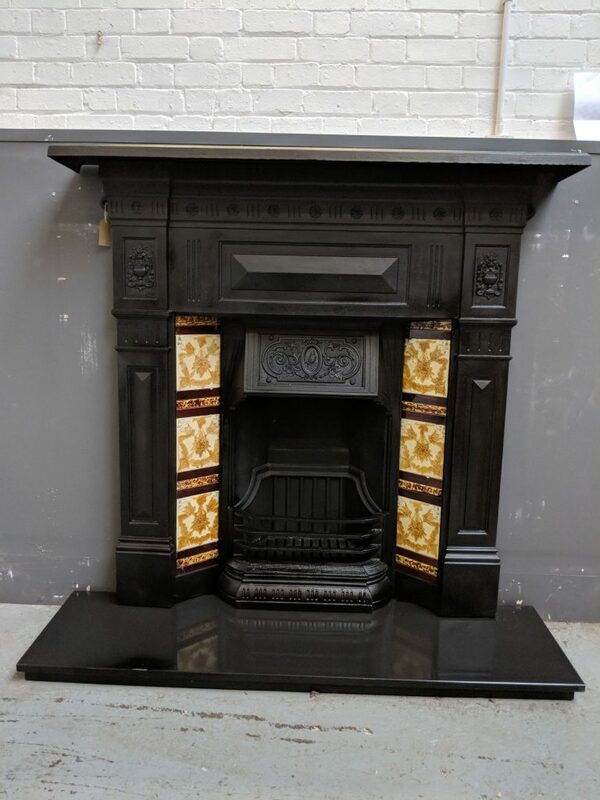 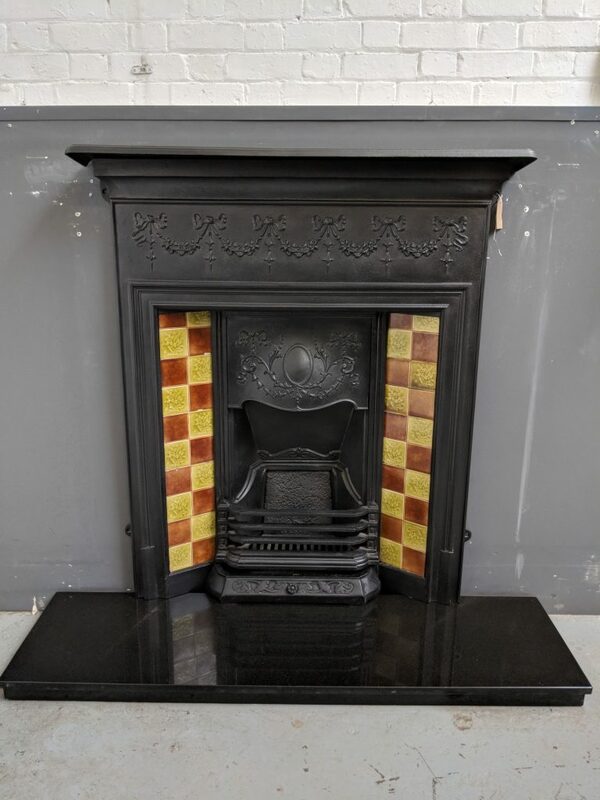 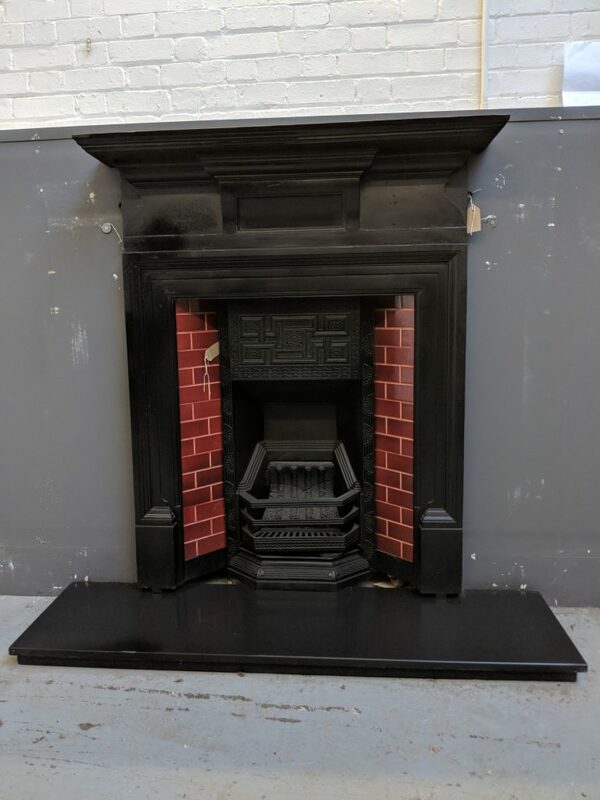 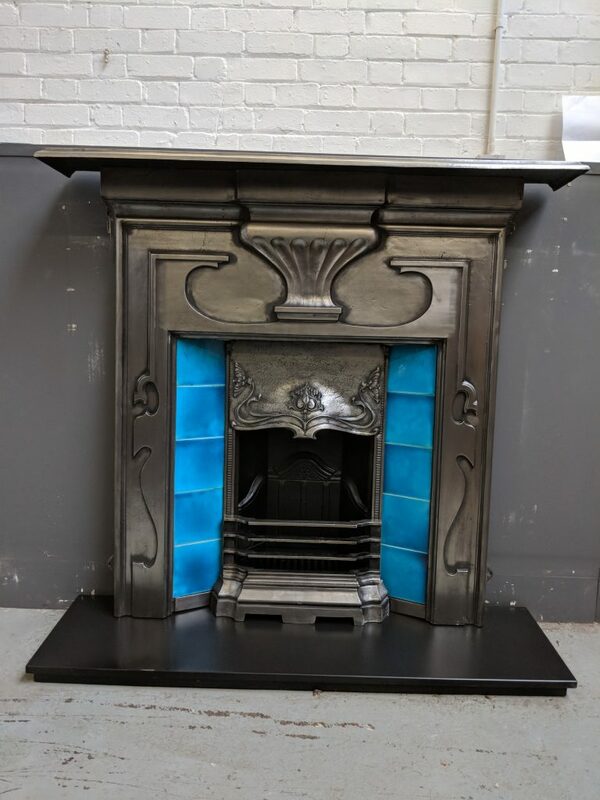 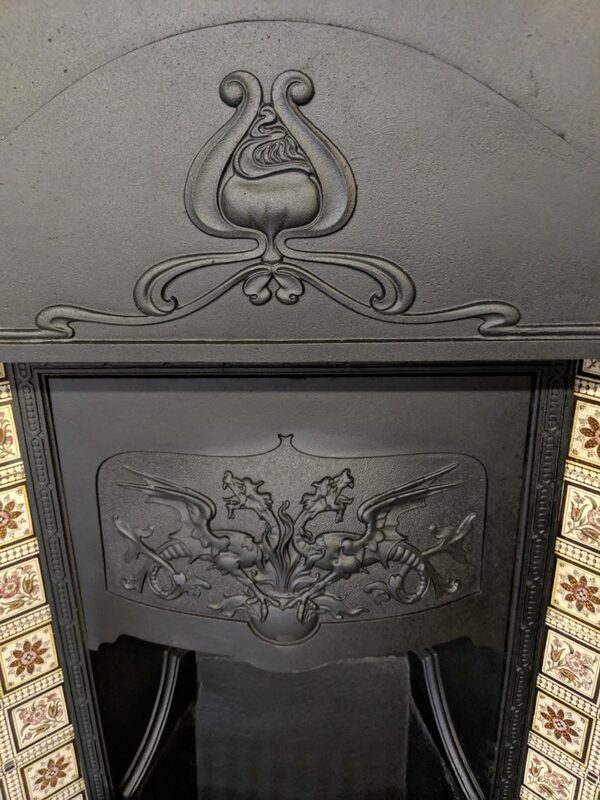 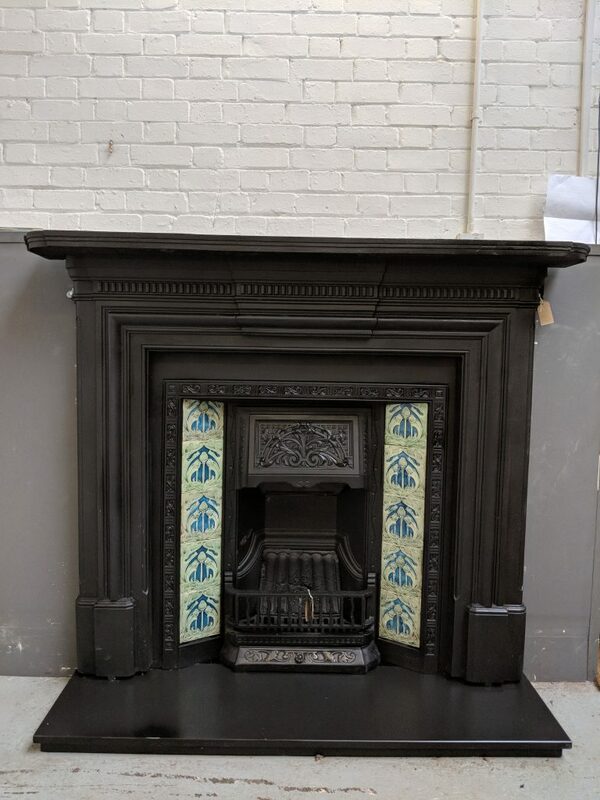 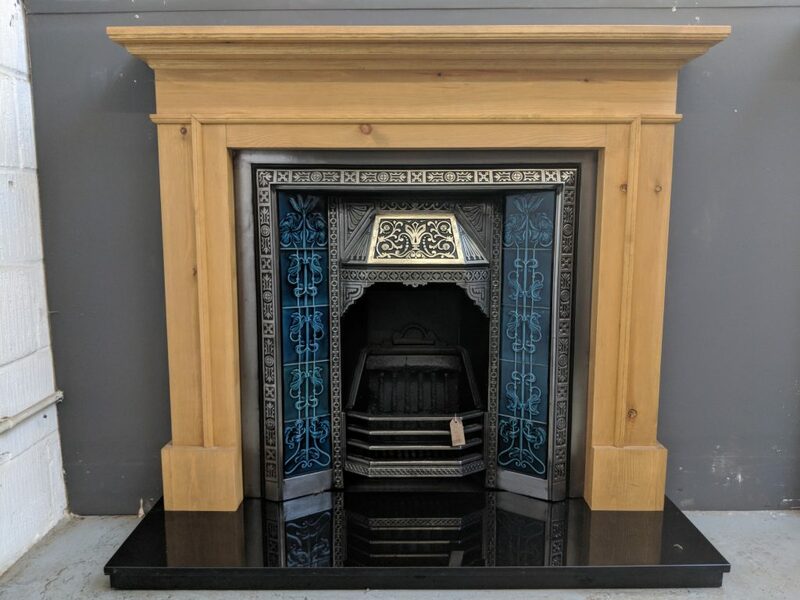 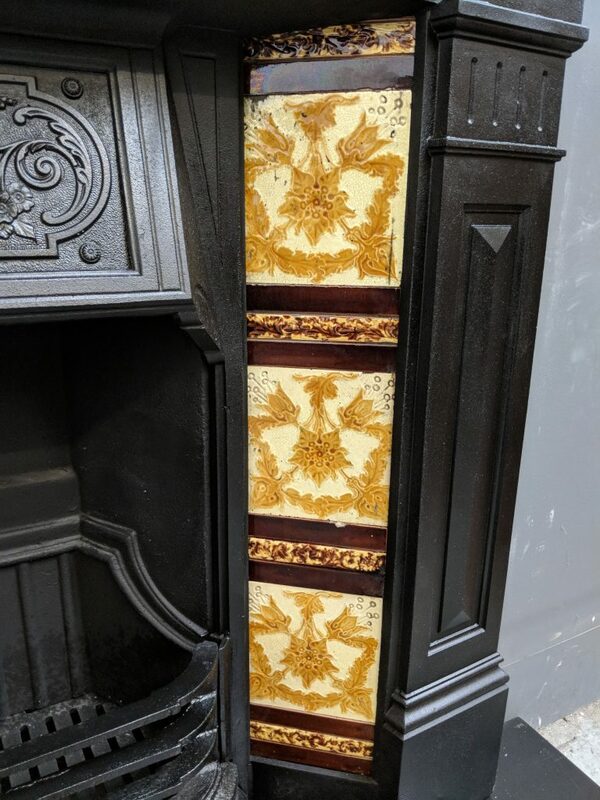 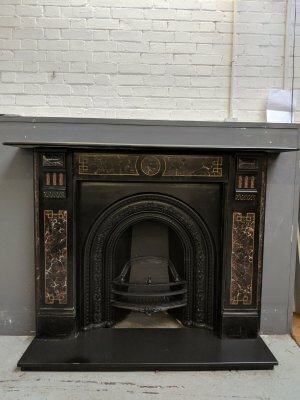 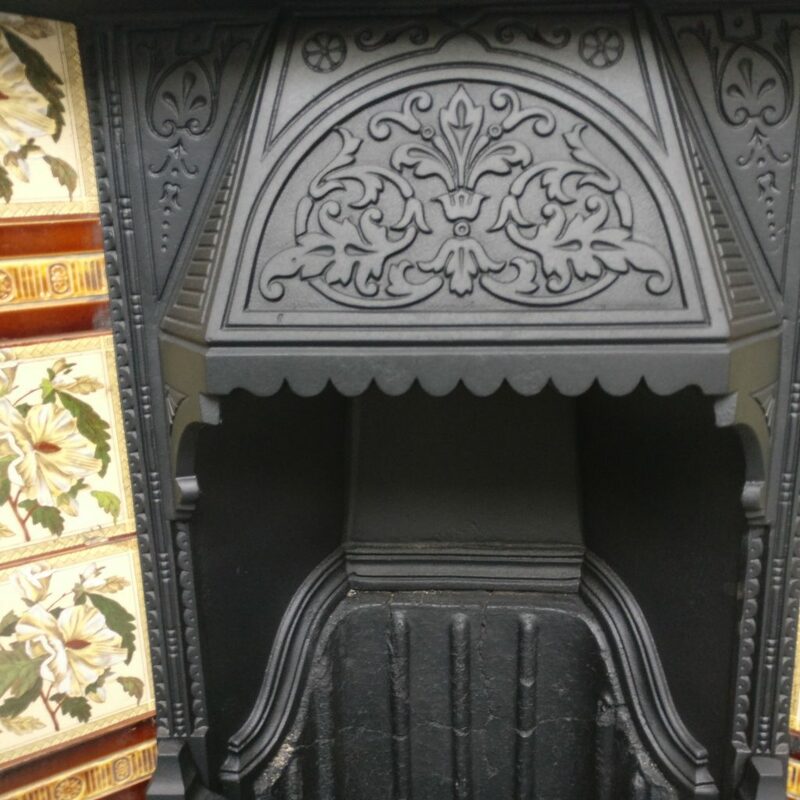 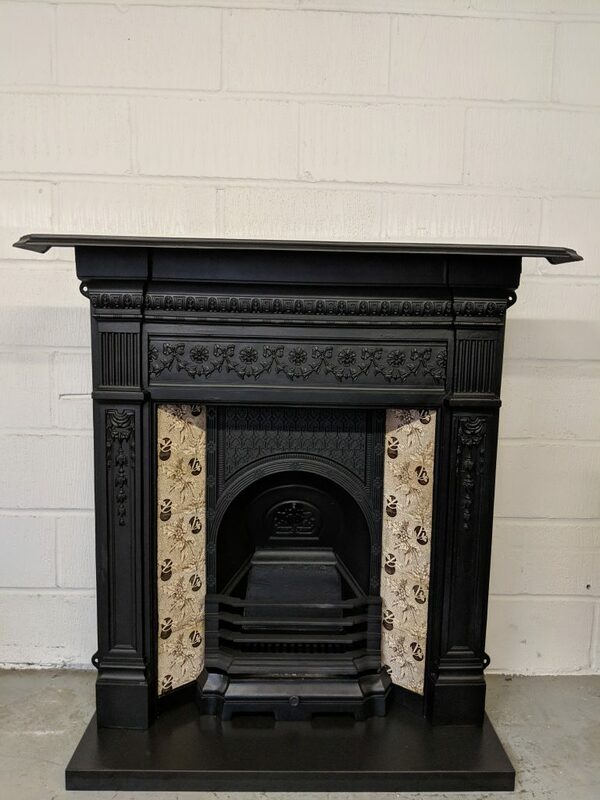 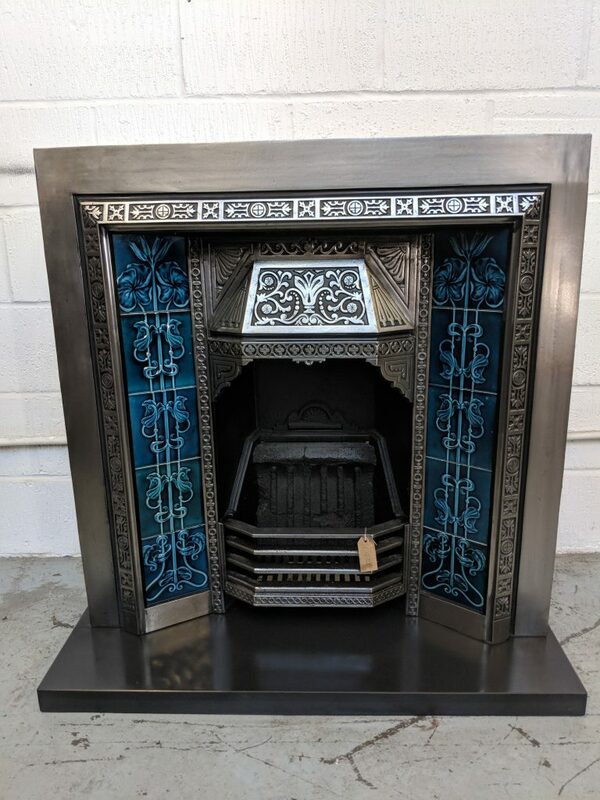 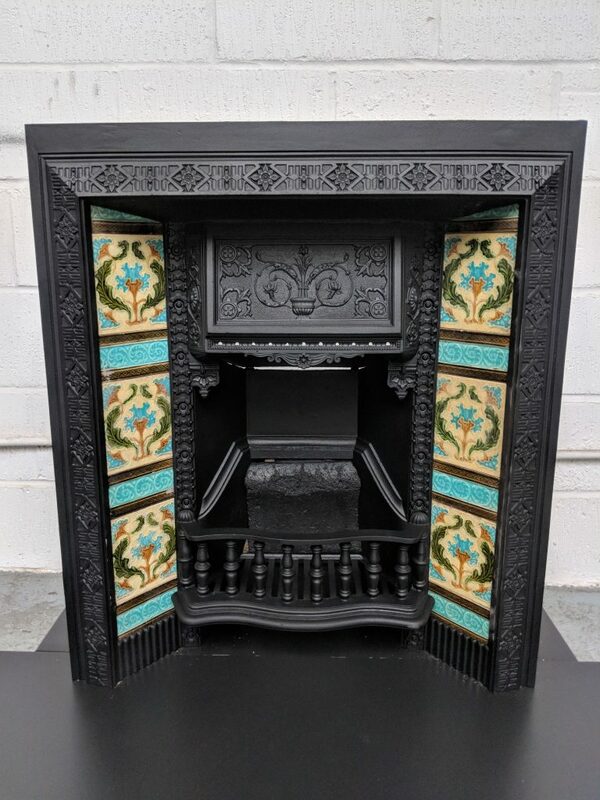 The fireplace is shown with a set of original Victorian tiles ref tile0011 priced at £250, all tiles are sold separately. 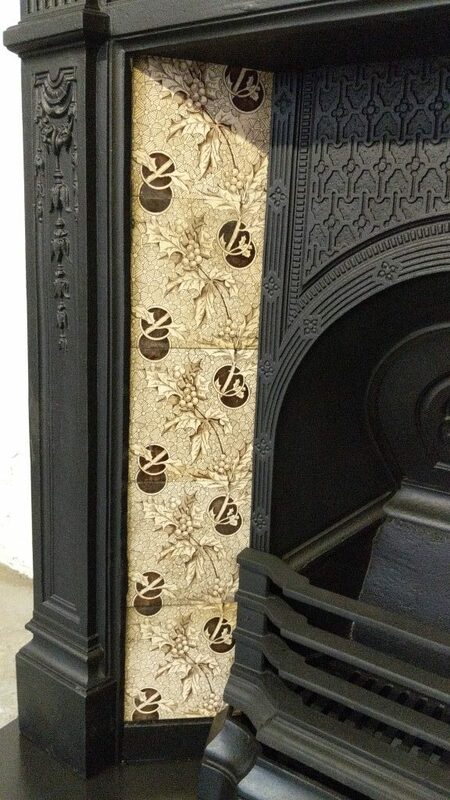 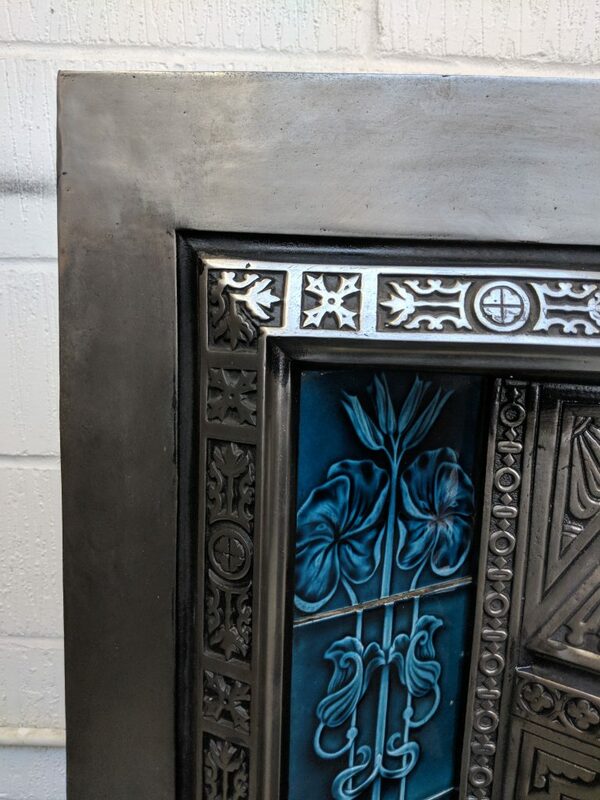 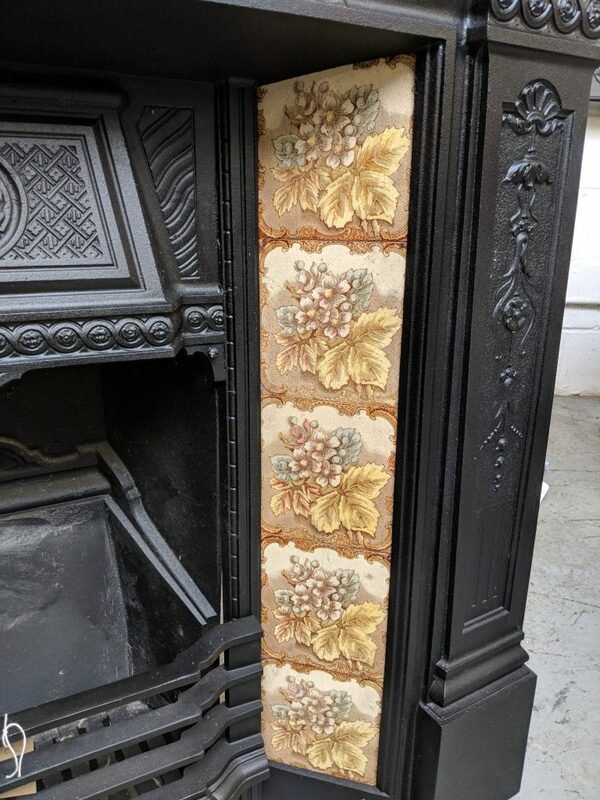 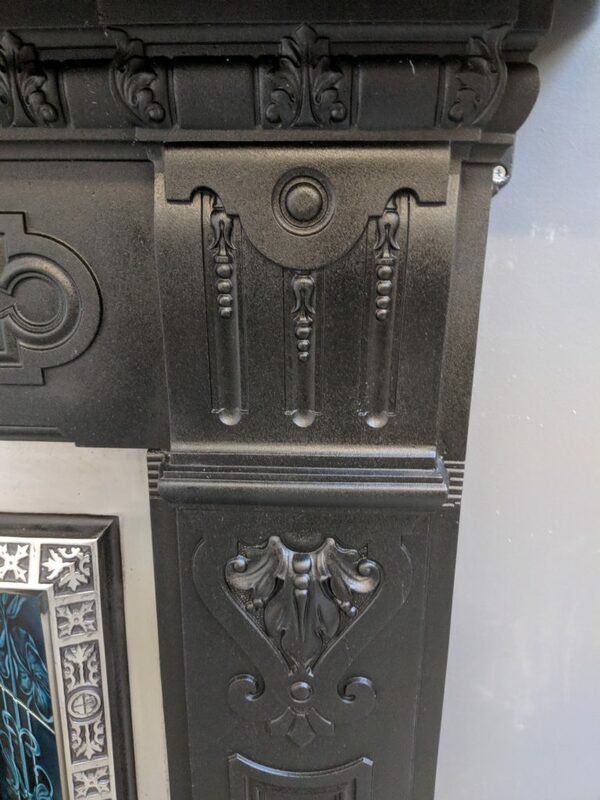 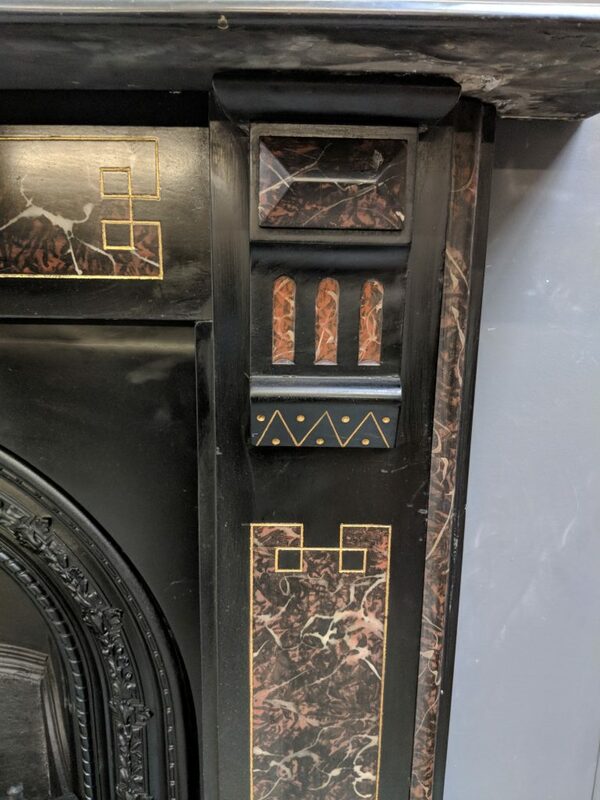 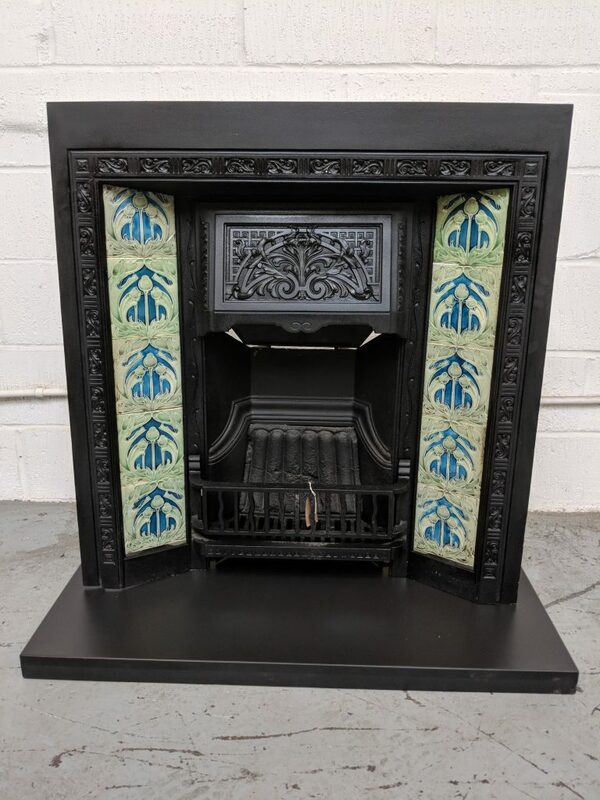 The fireplace is shown with a set of original Art Nouveau tiles ref tile0010 priced at £250, all tiles are sold separately. 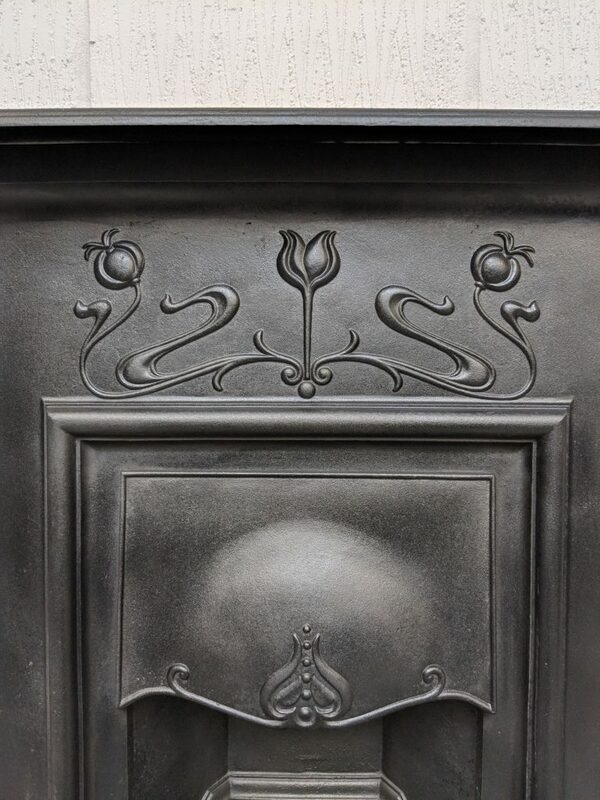 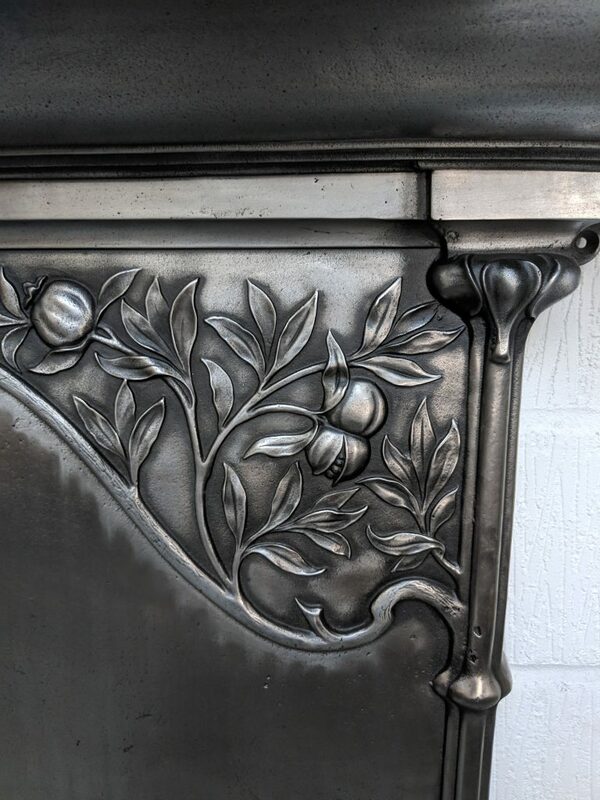 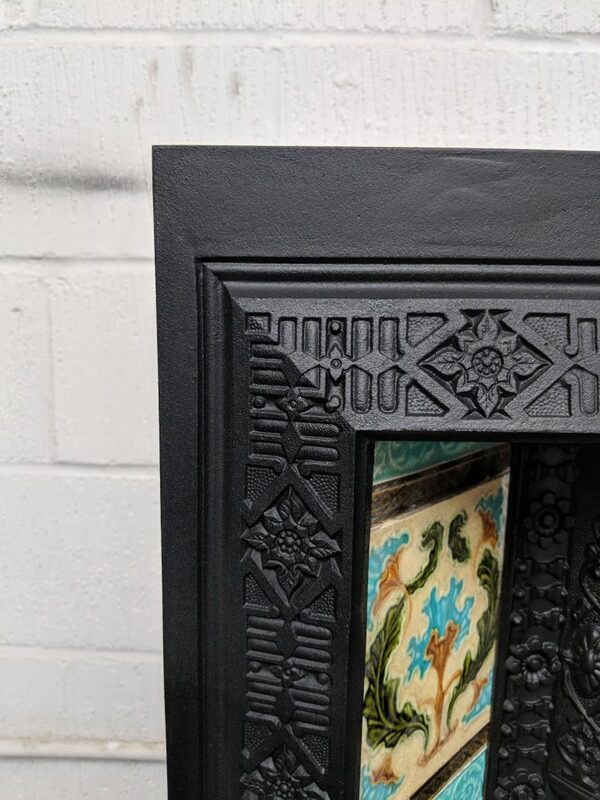 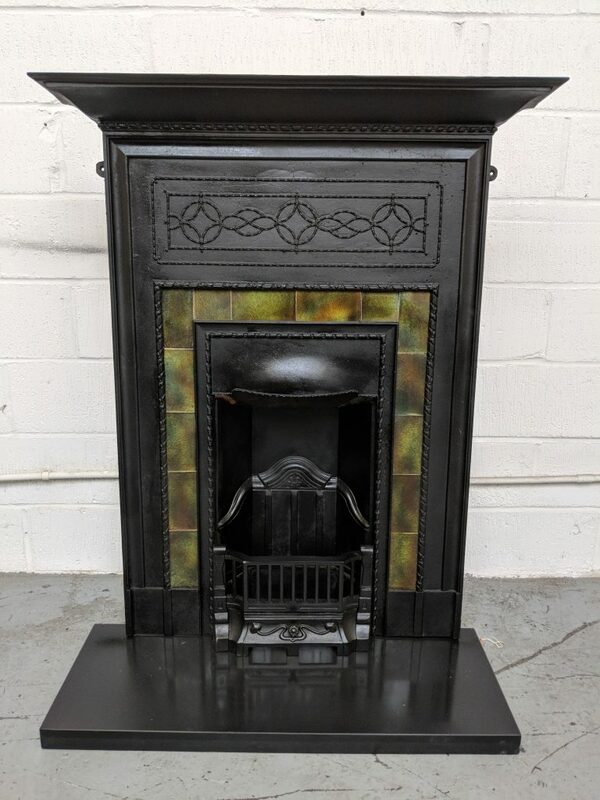 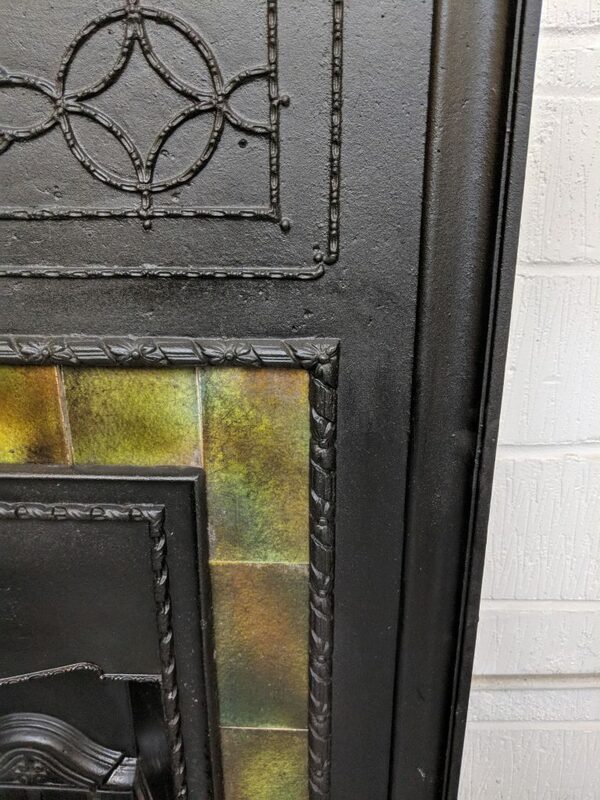 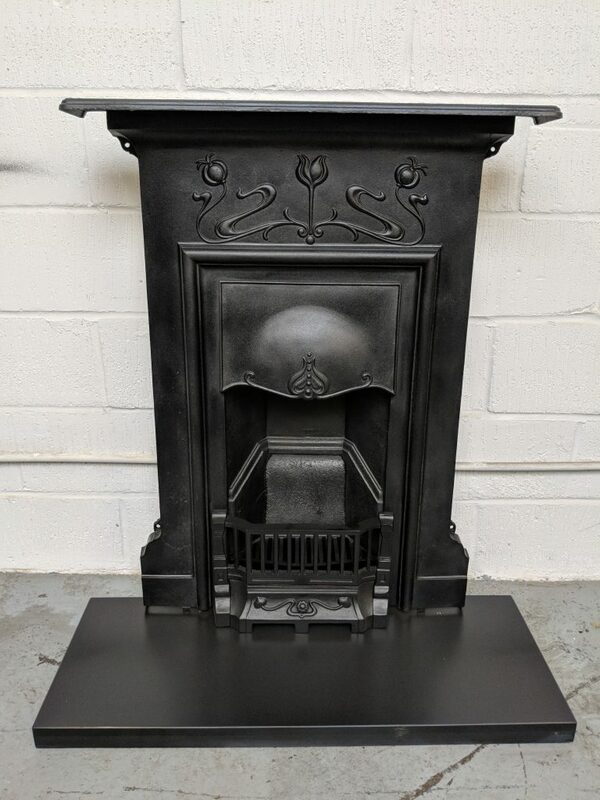 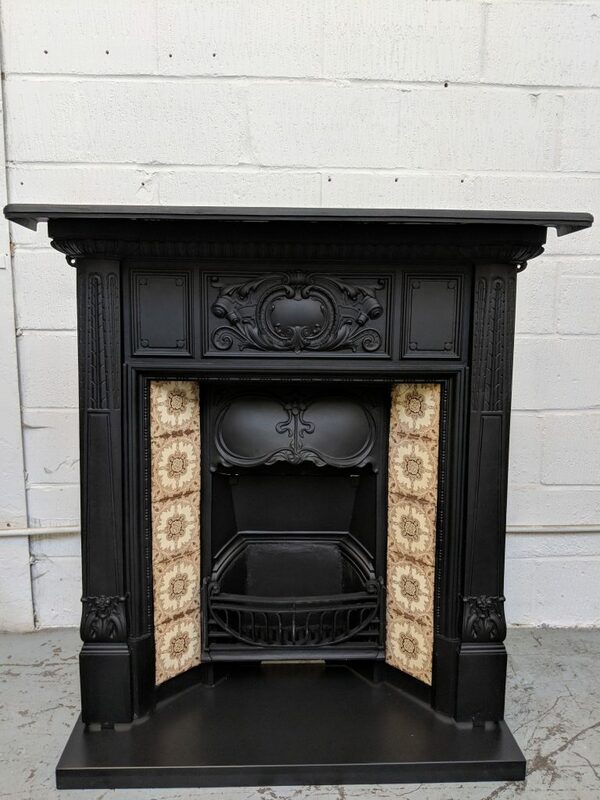 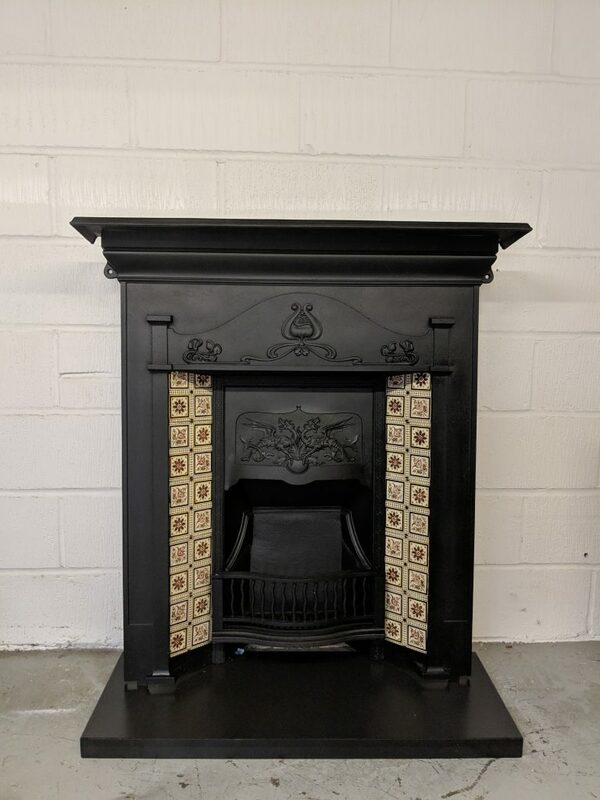 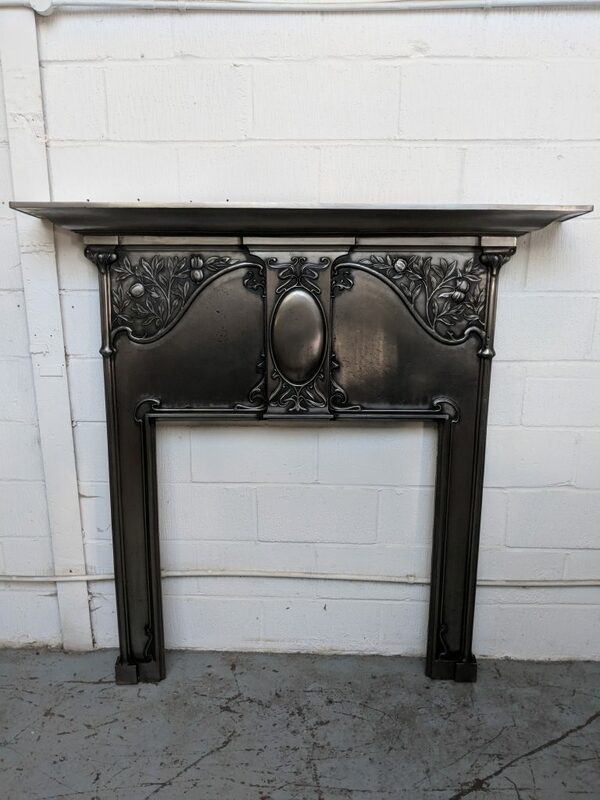 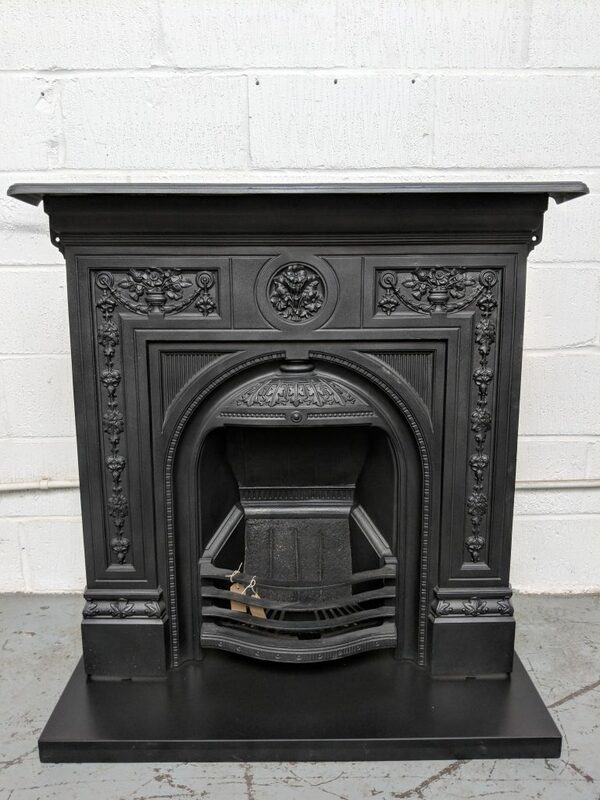 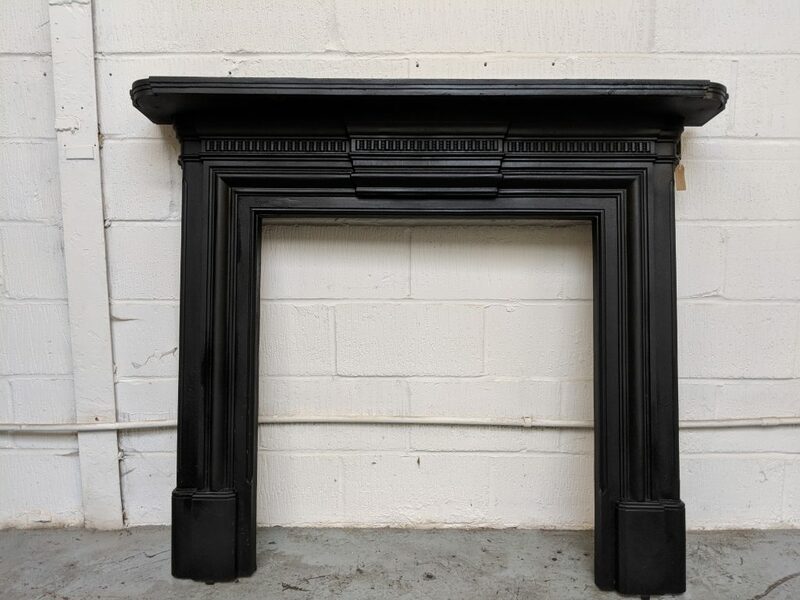 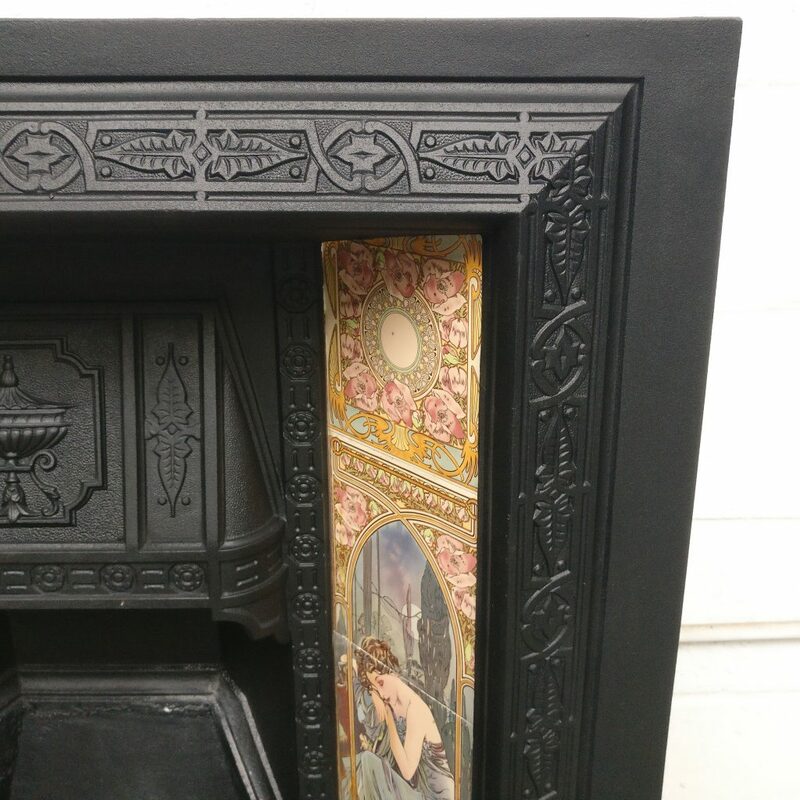 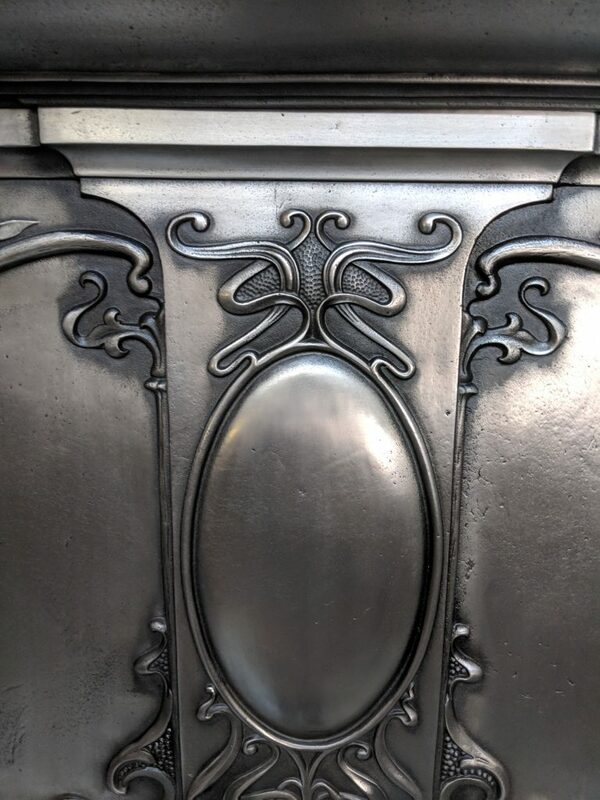 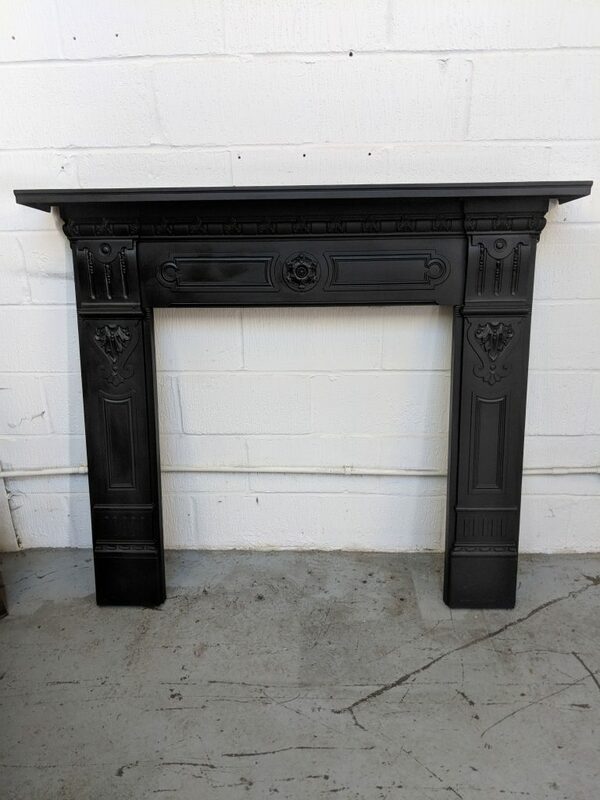 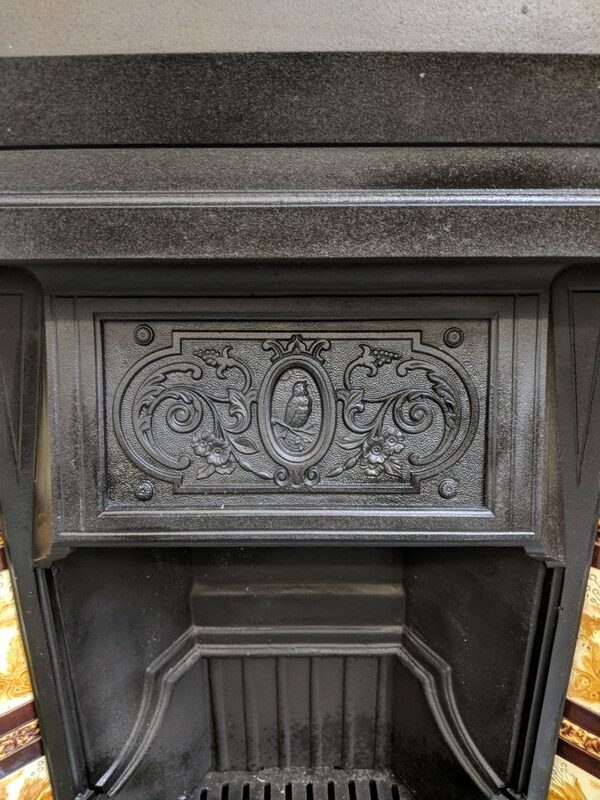 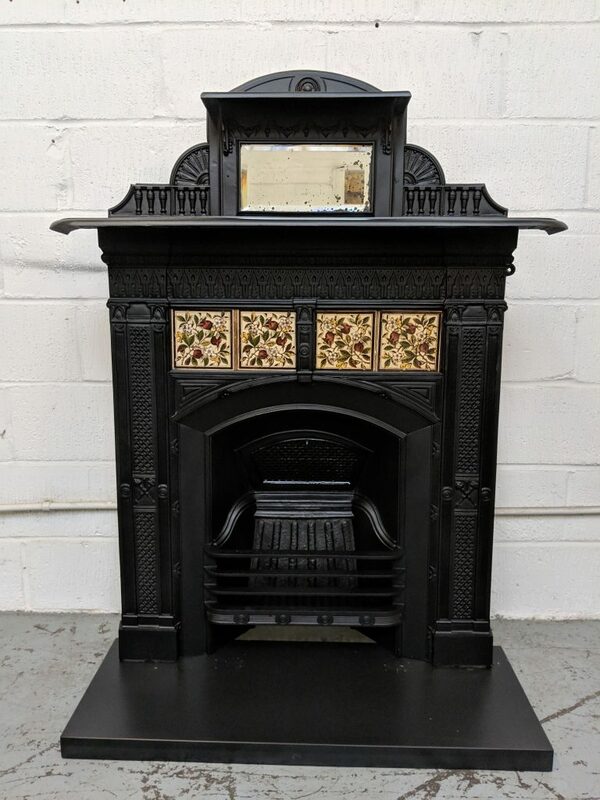 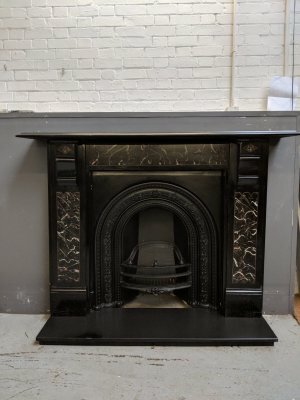 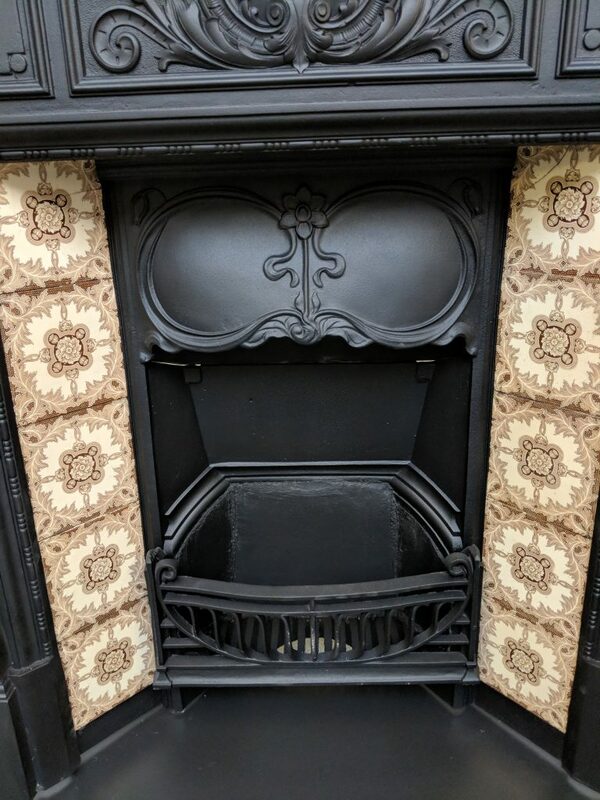 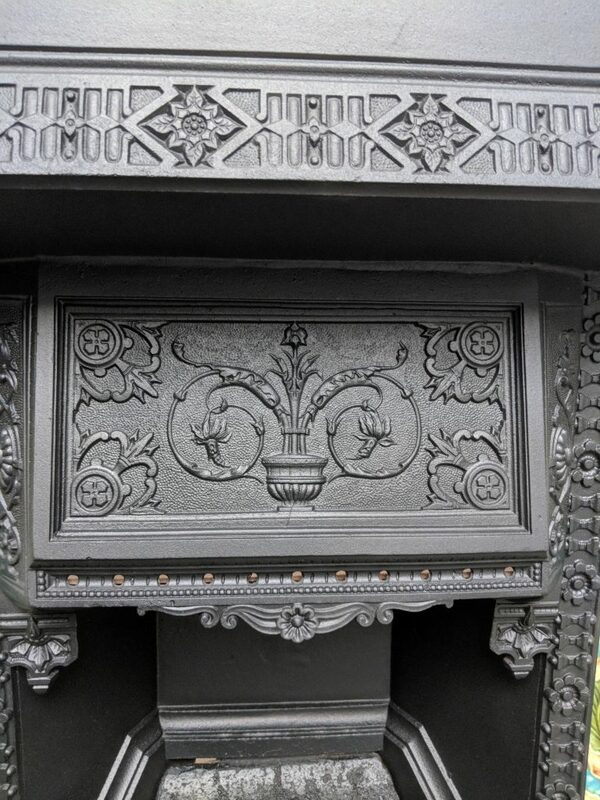 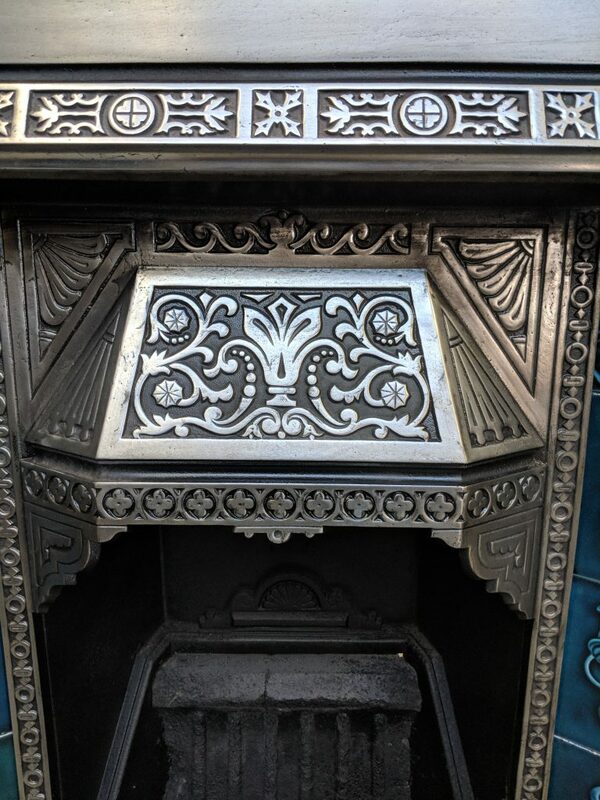 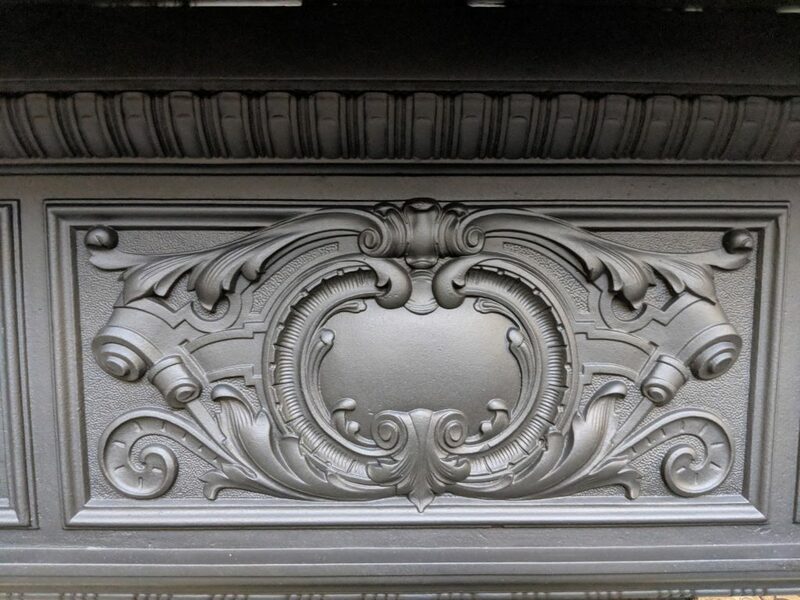 This is a Art Nouveau 38 x 38 inch cast iron tiled insert restored in a black finish. 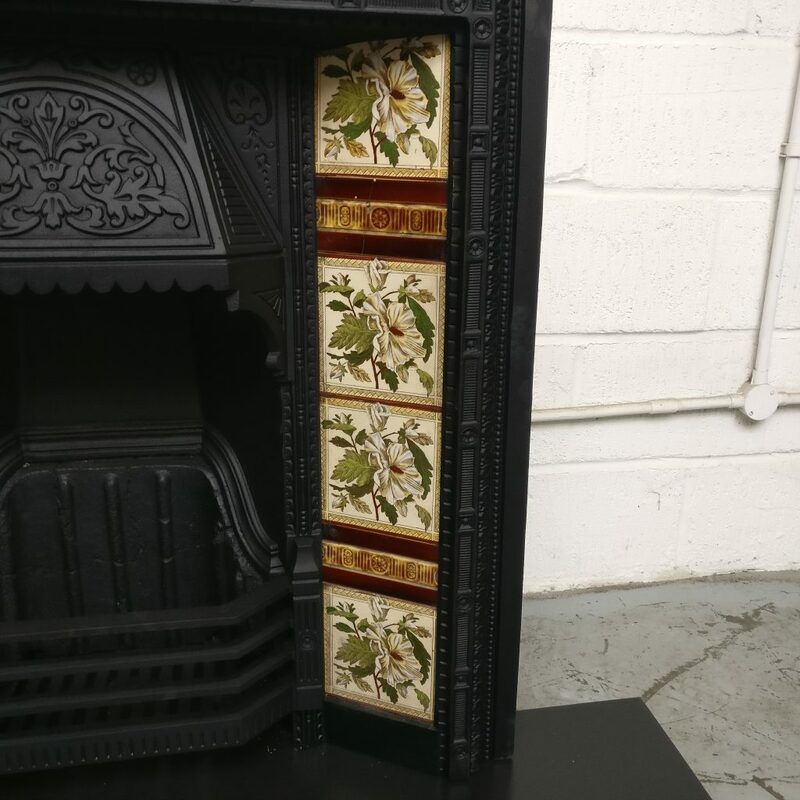 The fireplace is shown with a set of reproduction tiles priced at £100, all tiles are sold separately. 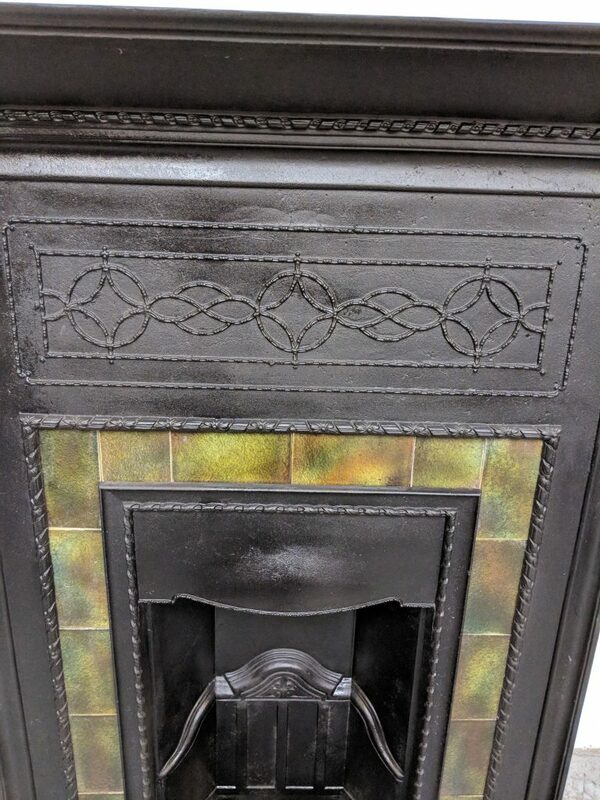 The fireplace is shown with an original set of tiles ref tiles0008 priced at £250 all tiles are sold separately. 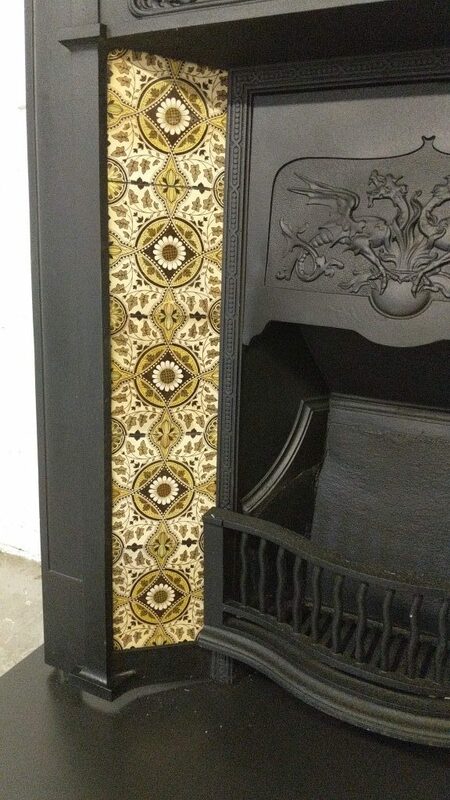 The fireplace is shown with an original set of tiles ref tiles0007 priced at £150 all tiles are sold separately. 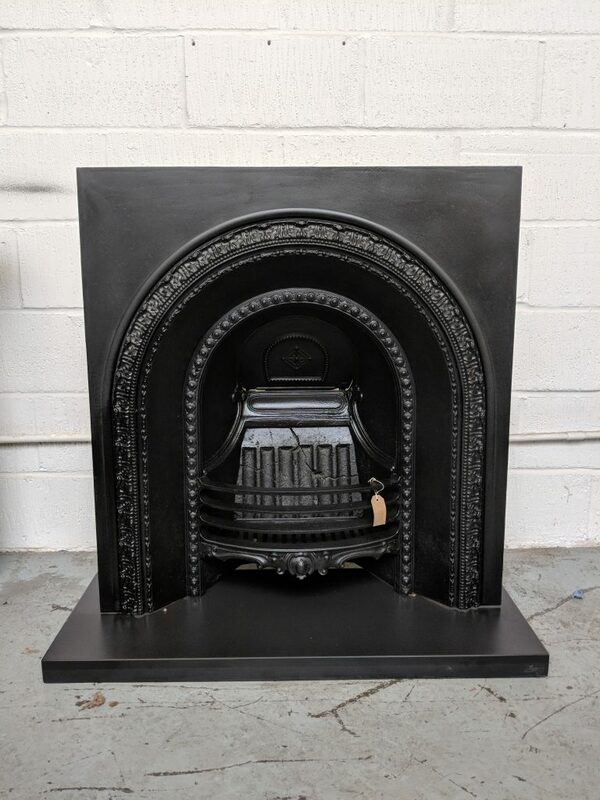 This is an original Victorian 34 x 36 inch cast iron arched insert. 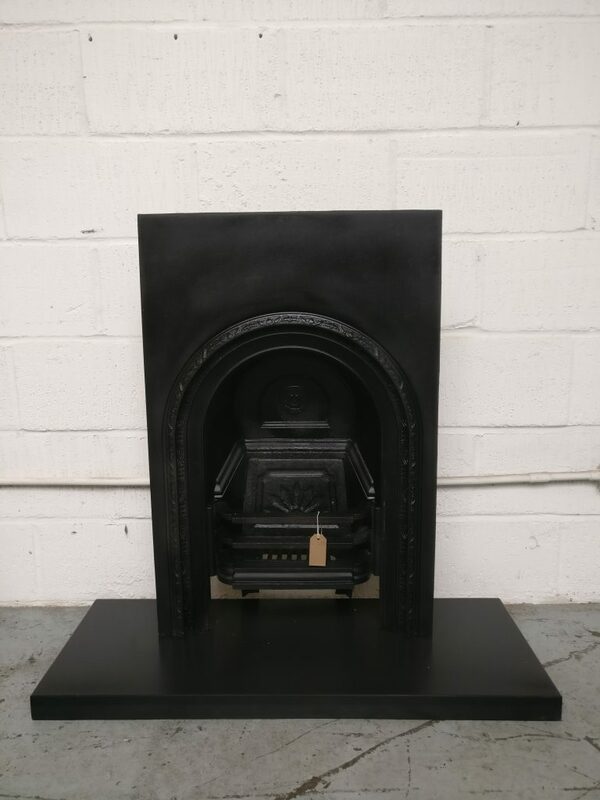 This is an original Victorian 30 x 36 inch cast iron arched insert. 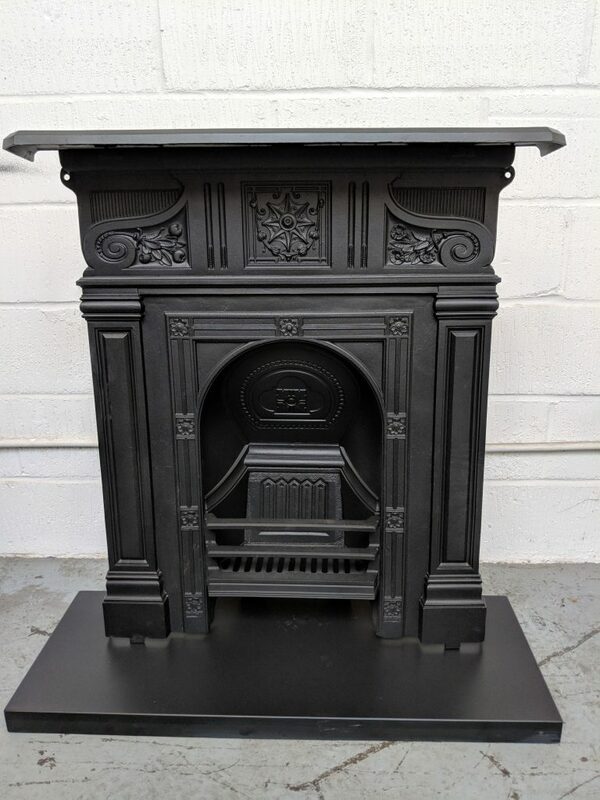 This is an original Victorian 35 x 37.5 inch cast iron arched insert. 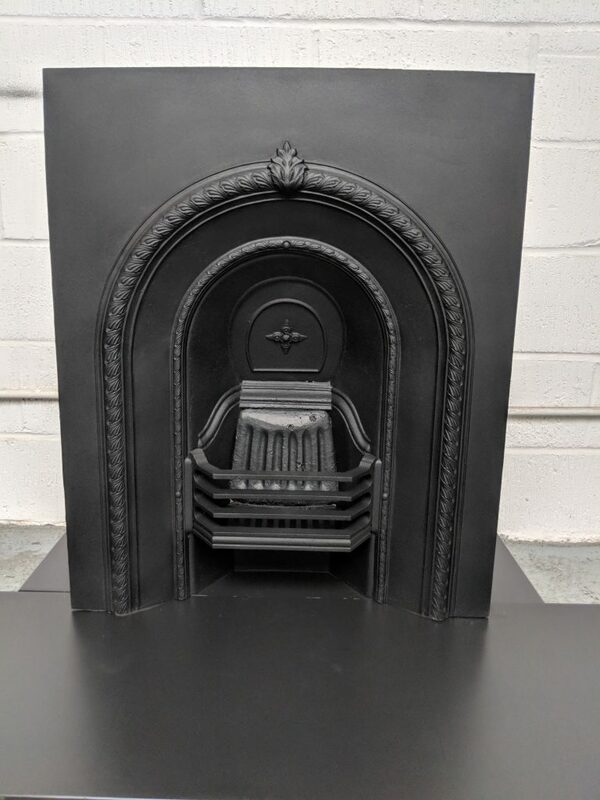 This is an Edwardian 24 x 36 inch cast iron arched insert. 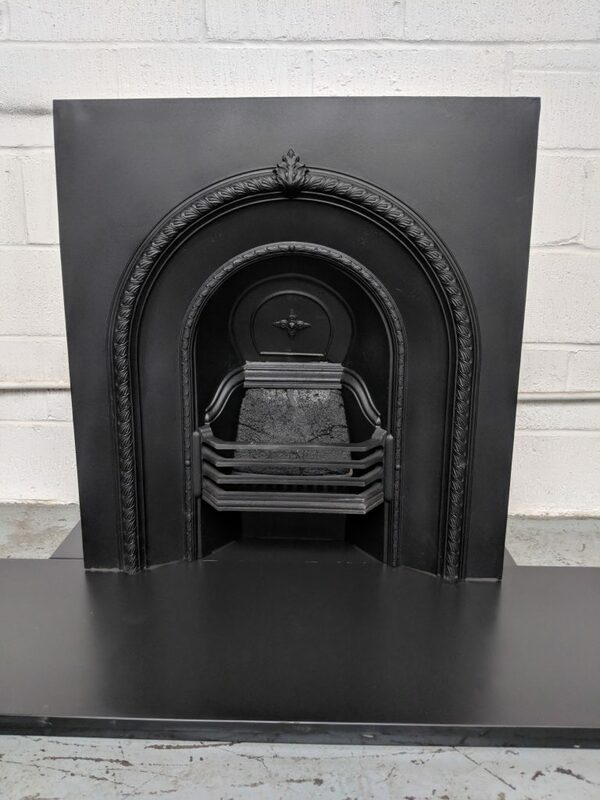 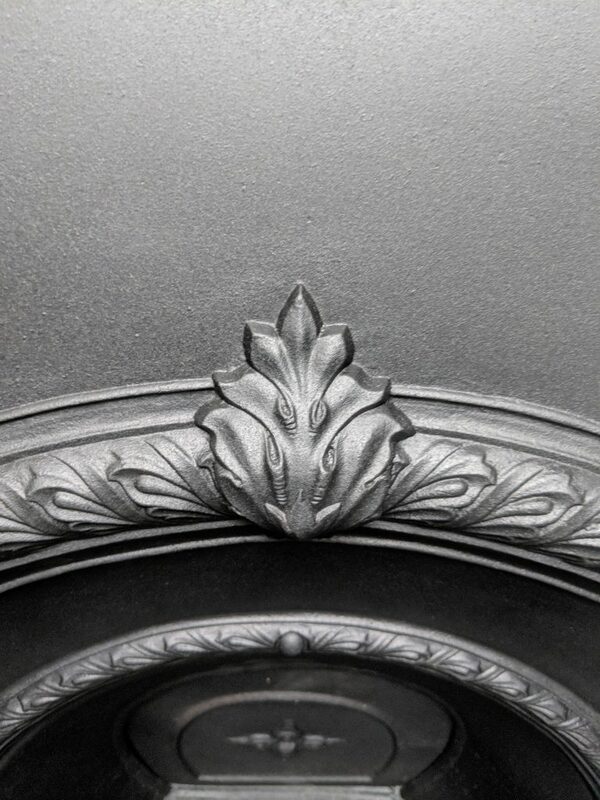 This is an Edwardian 30 x 36 inch cast iron arched insert. 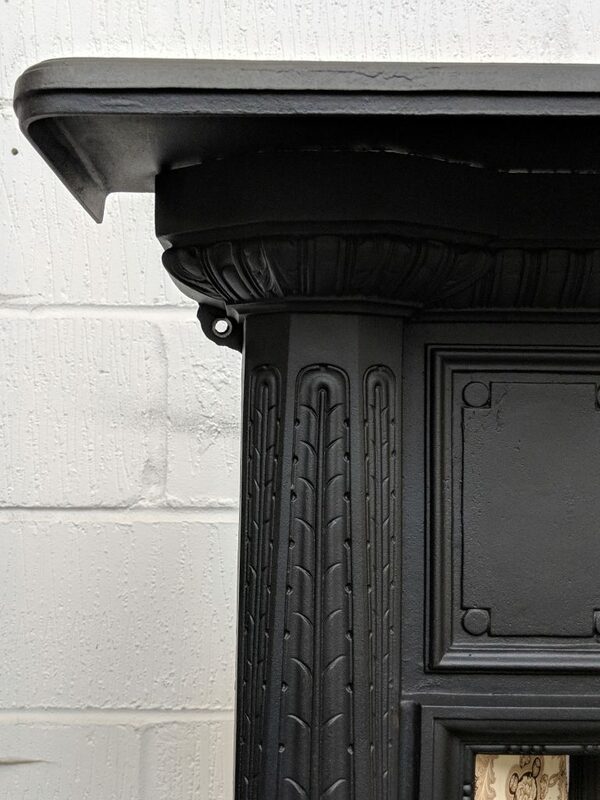 Total maximum measurement across the width of insert 30 inches. 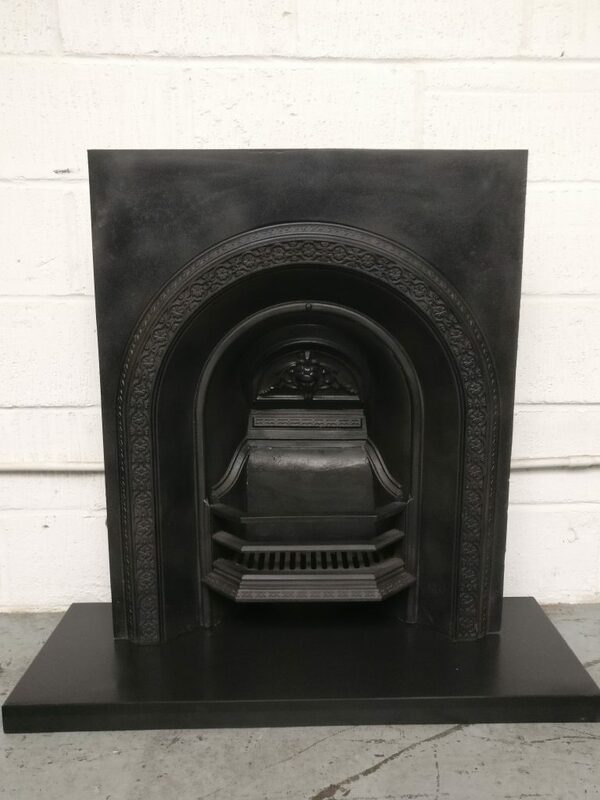 This is an original Victorian 32 x 36 inch cast iron arched insert. 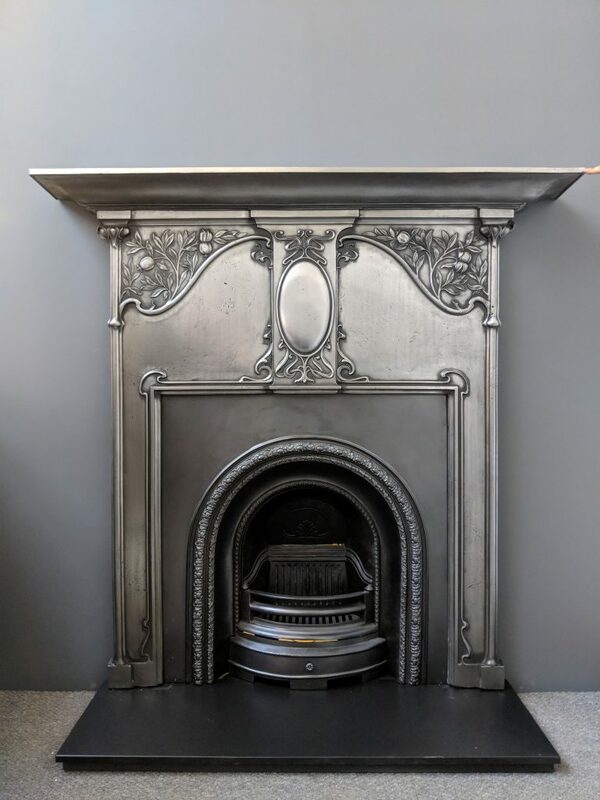 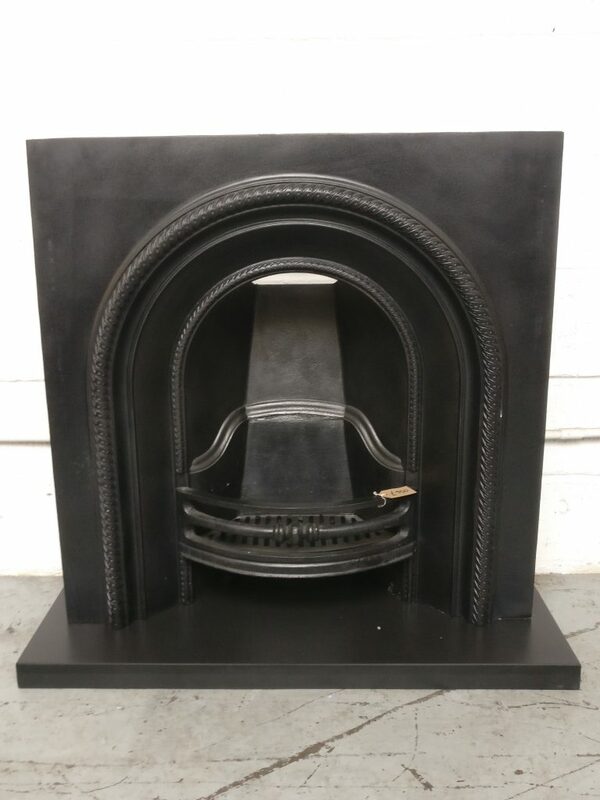 This is an Edwardian 36 x 38 inch cast iron arched insert. 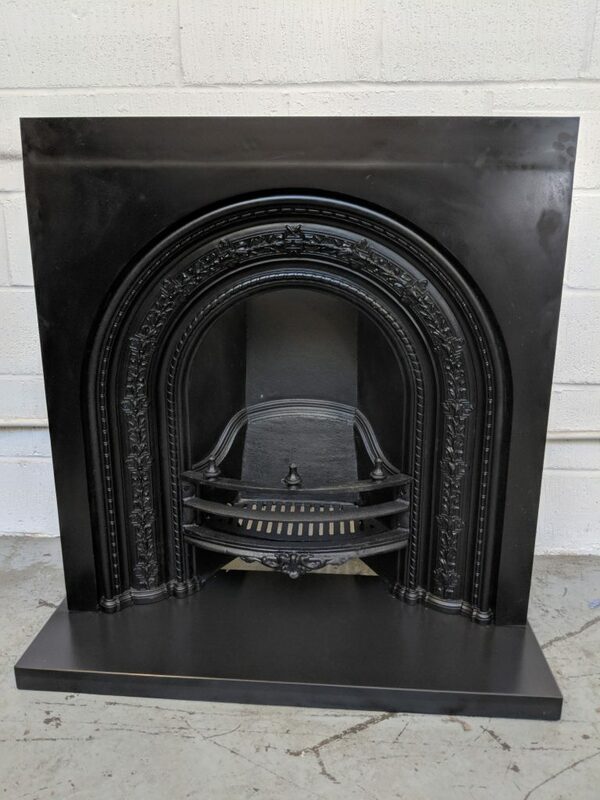 This is an antique restored Victorian 38 x 38 inch cast iron arched insert. 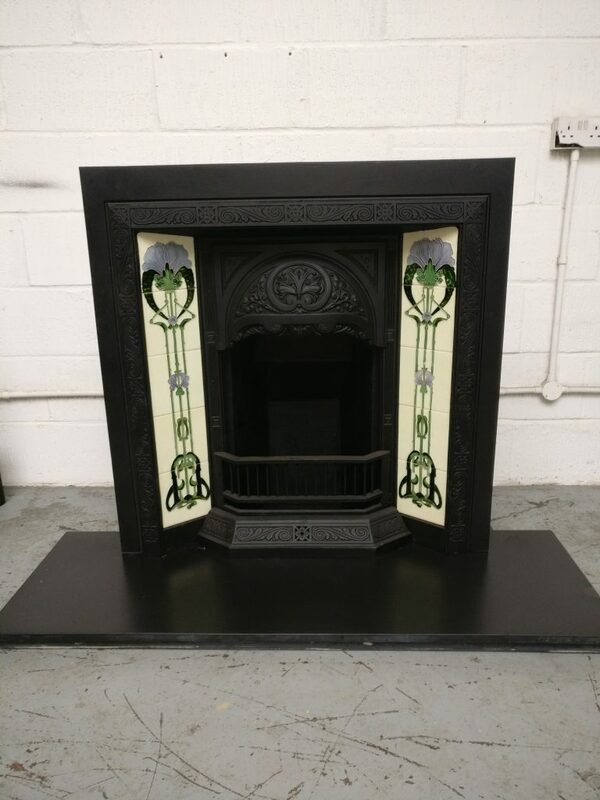 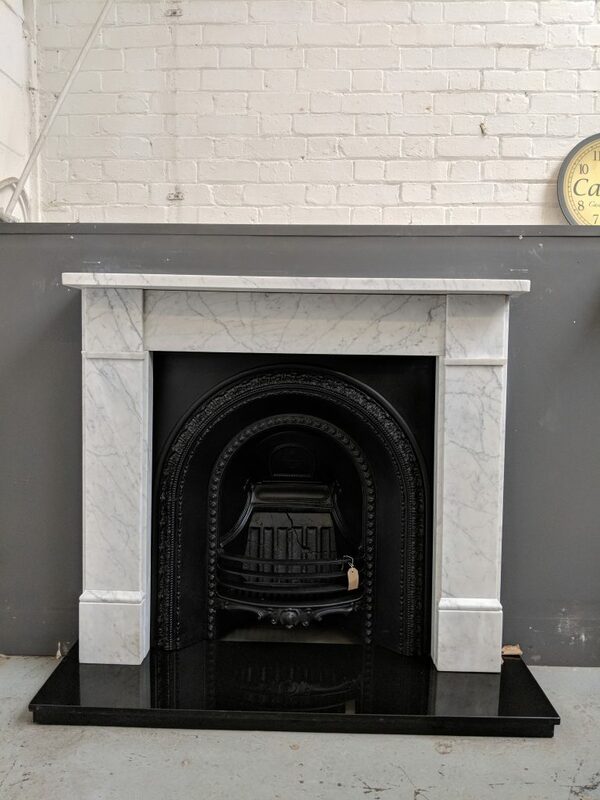 This Edwardian slate surround with painted marbleised panel inserts on breast plate and legs.